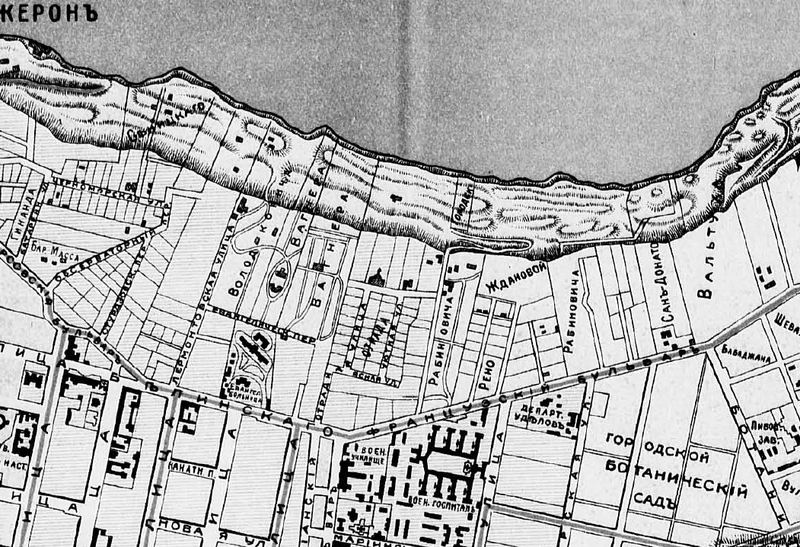 I was still puzzling over how people, whether rich, poor or somewhere in the middle, lived in Odessa in 1905. Which modern inventions were filtering down to people’s houses? They may have had bathrooms in middle-class houses but was there piped water to the bath? 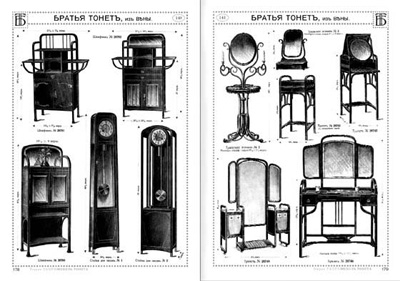 The 1902-3 Odessa directory was filled with illustrated ads for baths and toilets. There were none in the 1900 directory or later on, so these very early years of the new century must have been the moment when indoor plumbing became affordable and the idea needed getting across to people. But what about decor? Were art nouveau ideas, common in advertisements and posters, entering homes in other ways? 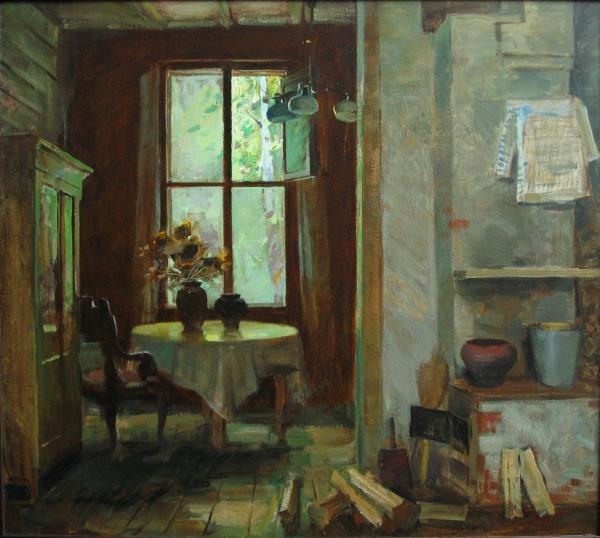 There were very few photographs of interiors at that time as the lighting was difficult, and the interiors portrayed by painters, many of their friends’ or patrons’ houses, may have been more modern, simpler, bohemian or avant-garde than ordinary people’s houses. 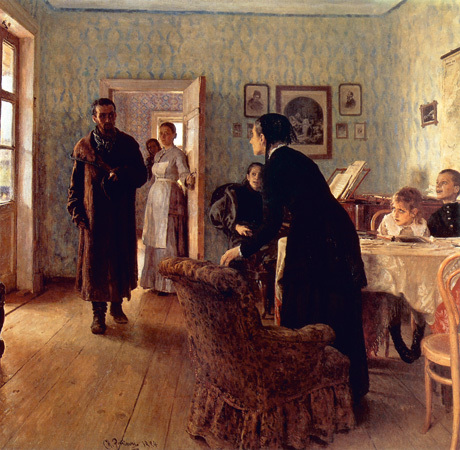 When I recently first saw the painting by Ilya Repin ‘Unexpected visitors’ (in Russian ‘Не жда́ли’ ‘they did not expect anyone’) in a TV programme on perception (the painting was used by a Russian psychologist in the 1960s to research ideas about how the eyes track images), I thought it had been painted in the early 1900s but the date is 1883-1888 (there were several versions and reworkings) and the room in the painting is the artist’s country house sitting room. 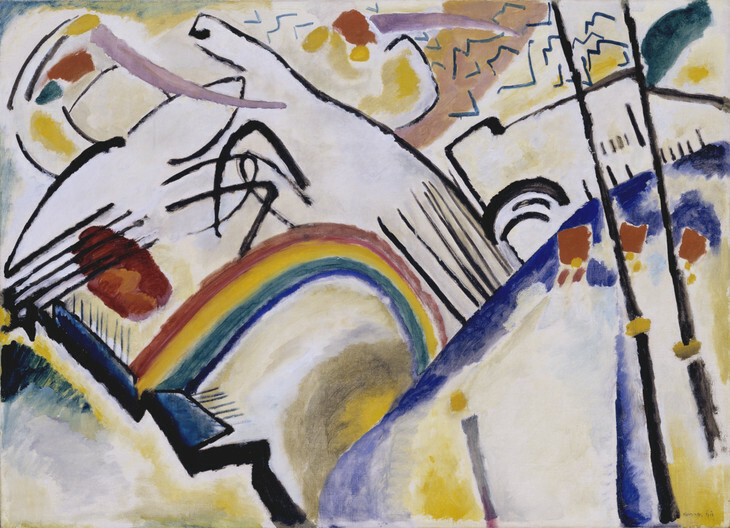 The painting is about the return of a political exile from Siberia. 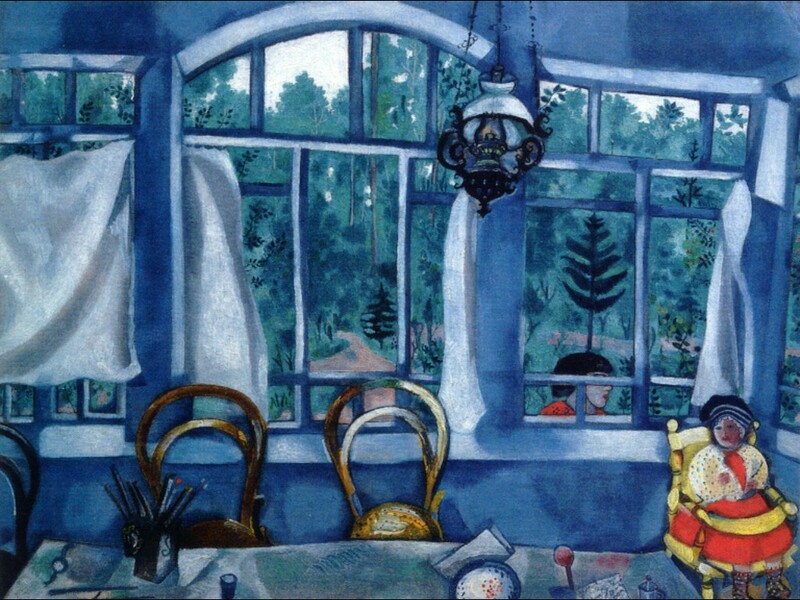 I love the way he has created this story around the incongruous figure in such a light, summery cheerful room. Possibly because it is a country house used in good weather, there are bare floorboards and the windows do not have heavy drapery. It has a feeling more of Swedish design than an overcrowded Victorian sitting room. 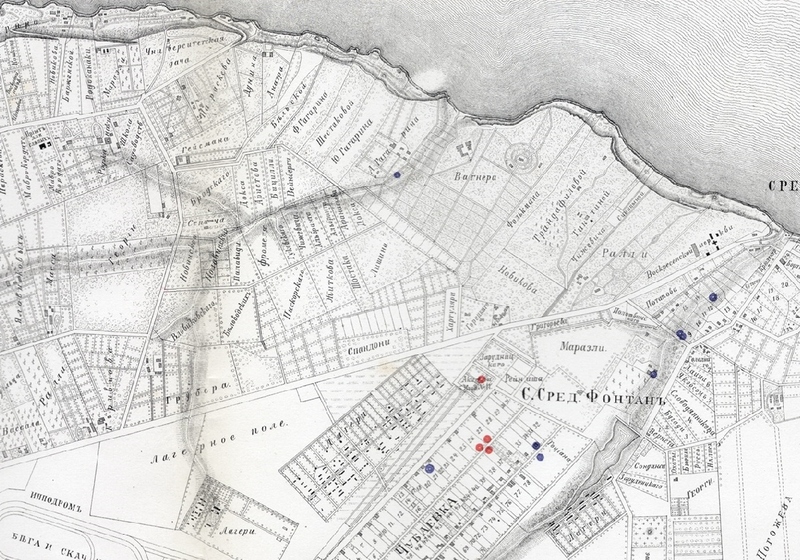 And so I went back to my search of how people might have lived in Odessa in 1905, such as the artisans and shopkeepers who were probably in the forefront of those whose businesses, homes and lives were destroyed in the pogrom. 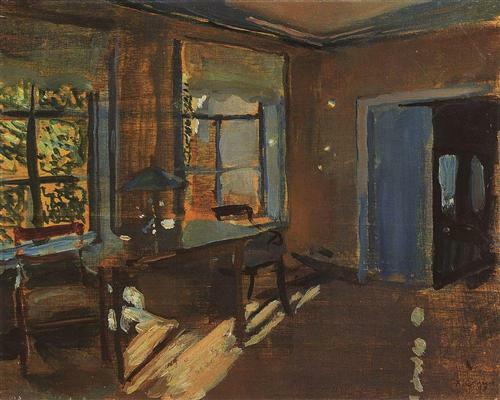 First I looked through a film I had recently found online of Kataev’s The cottage on the steppe (Хуторок в степи) for images of the family’s apartment in Odessa and the smallholding they later rented at Bolshoi Fontan. The story begins with the news of Tolstoy’s death in 1910 and, soon after, the Bachei father loses his teaching job after making a speech about the greatness of Tolstoy, who had been excommunicated by the Orthodox Church. After trying various unsuccessful ways to make ends meet, the aunt, who has brought the two Bachei children up, decides on a move to a rented smallholding with several acres of fruit trees in Bolshoi Fontan. 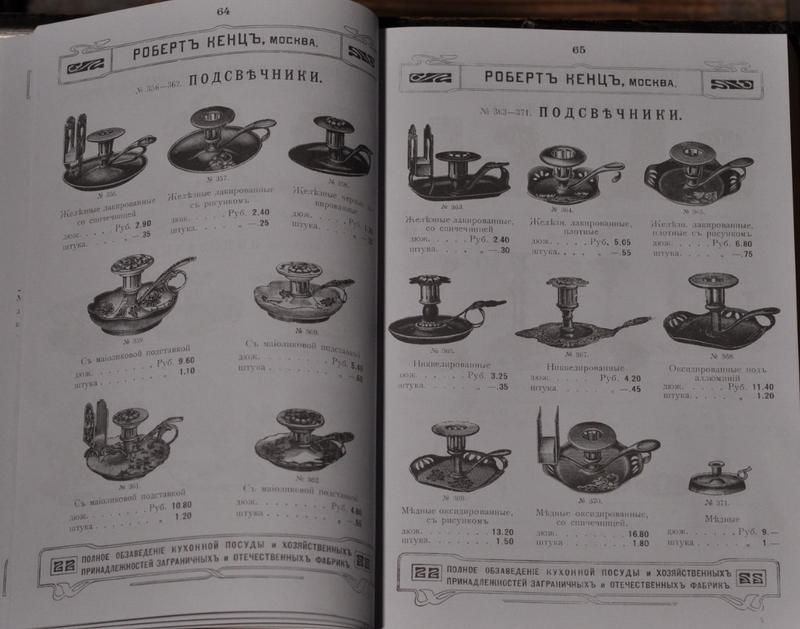 I was also able to find a couple of catalogues of household objects sold in Russia at that time. When the family begins their move to the smallholding, Petya stays with his working-class friend in Near Mills until his exams are over. There are a few outdoor shots of the cottage in Near Mills, a rare view of the little farmhouse on the smallholding, and a few scenes showing the interior. Bentwood rocking chairs and dining chairs were very common at the time. 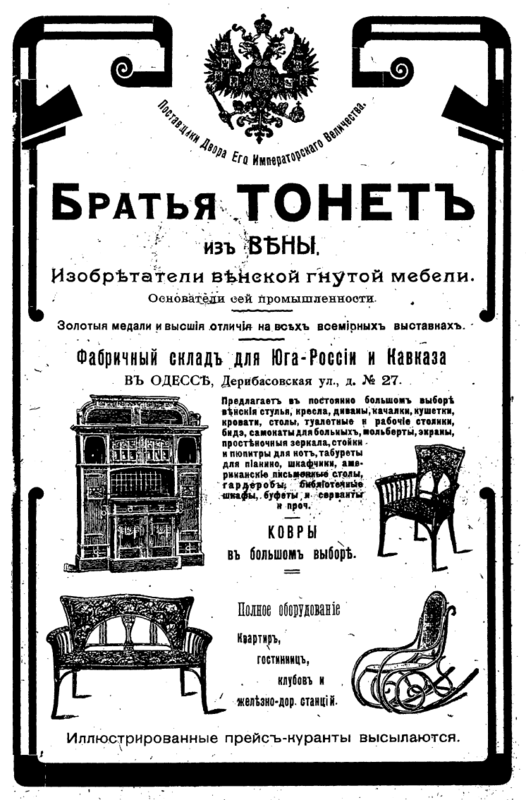 There is an ad in the Odessa 1908 directory for the Austrian-German company that originally made bentwood furniture in the mid 19th century. 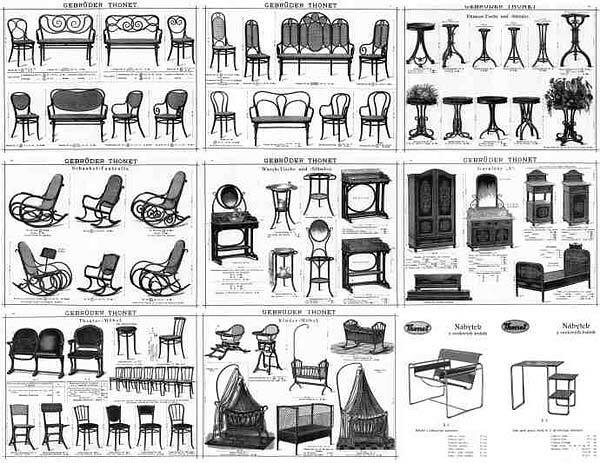 The company was set up by the cabinetmaker Michael Thonet (1796-1871) whose work was carried on by his sons and their factories and showrooms spread across the world. 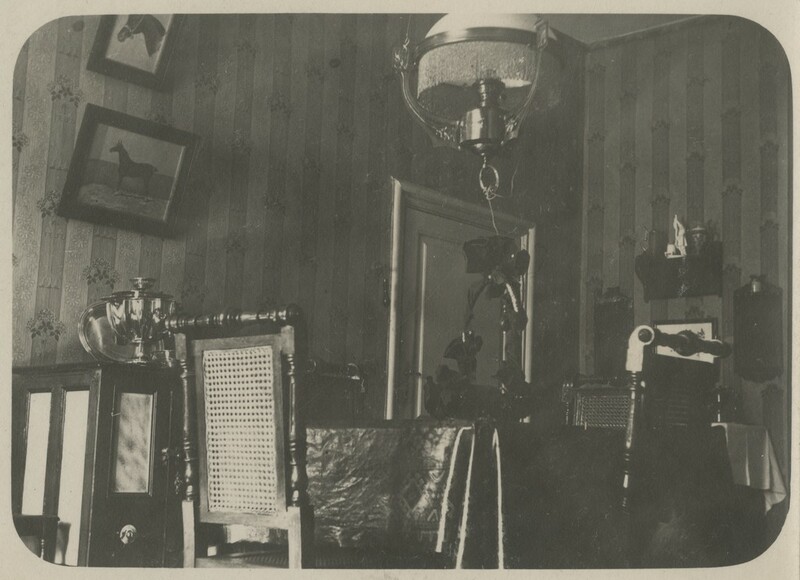 The few Russian photographs of interiors from around 1900 that exist show rooms very similar to those in the Kataev film, which must have been the common style for anyone who could afford to buy furniture, either new or second-hand, and gives an idea of the everyday lives of people around 1905. 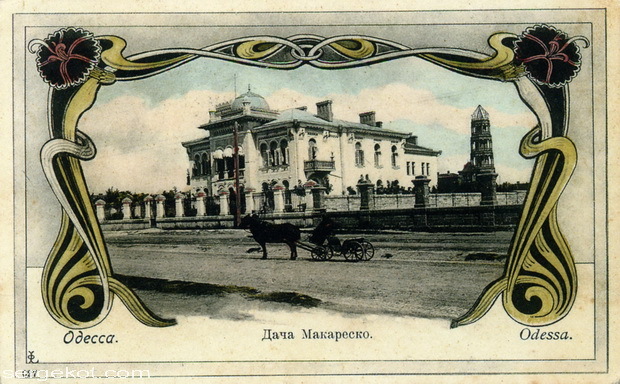 Although Moldavanka was the centre of Jewish life in Odessa, Jews lived in every part of the city. Possibly because it was a major Black Sea port and there were people of many nationalities and different ethnic groups, it had a history of integration and assimilation in different sections of the city, along with periods of tensions between the different groups. Over the days of the pogrom, hooligans spread out to wherever it was known that Jews lived. In his famous story, The lonely white sail or The white sail gleams, Kataev describes the hooligans ransacking the Jewish shop in his apartment block on the outskirts of the centre on Kulikovo Field, and then moving down the French Boulevard to another Jewish family. 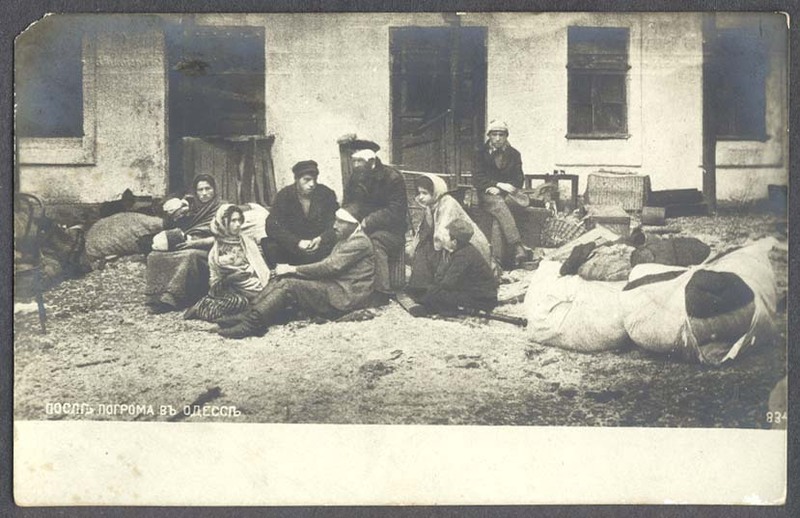 The 1906 pogrom report describes hooligans going out to the summer resort, Bolshoi Fontan, ransacking and burning Jewish summer houses, and terrorising Jews still there in the autumn, who lived there full-time. These were not the poor working class or wealthy merchants, but ordinary tradespeople, craftsmen and middle-class shop owners, teachers or civil servants. The fates of the Jews who were spread out across the city may never have been known and are therefore absent from the history of the pogrom. My grandparents were probably typical of this group and I wondered if I could work out, from various bits of gathered information, more about how and where they might have lived. In a piercing North wind, on a February day in 1920, the whites fled from Odessa, firing a few parting shots at the town… The shops shut down… The busy market squares had turned into deserts of cobblestones. Only the cats, unsteady with hunger, wandered about looking for scraps. But scraps in Odessa were a thing of the past. Before describing the events that followed, I should say something about Black Sea Street. I grew very fond of this small suburban street and believed it to be the most picturesque in the world. Even the way to it from town was a tonic against adversity, as I often experienced. 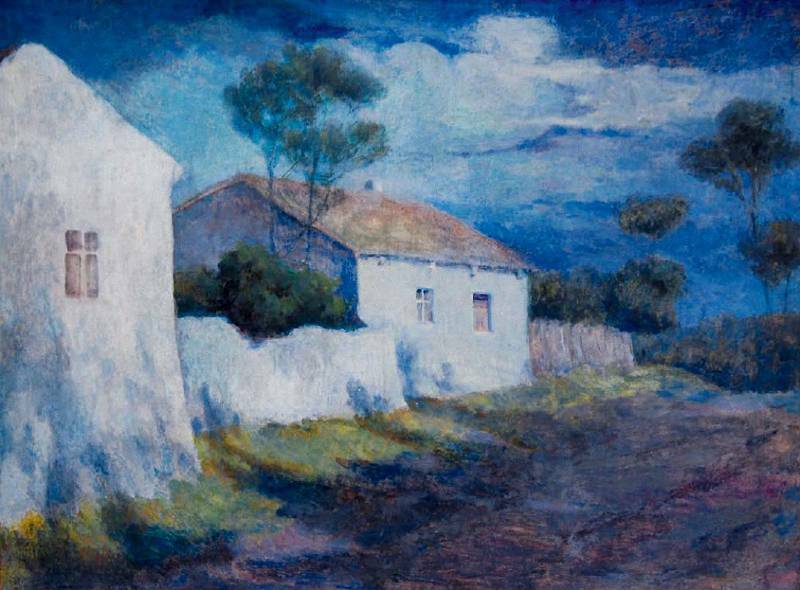 I might be walking home, utterly dejected by some failure, but as soon as I found myself in the deserted alleyways around Black Sea Street – Observatory Lane, Sturzo Lane, Battery Lane – and heard the rustling of the old acacia trees, saw the ivy dark on walls gilded by the winter sun, felt the breath of the sea on my face, I at once recovered my peace of mind and lightness of heart. 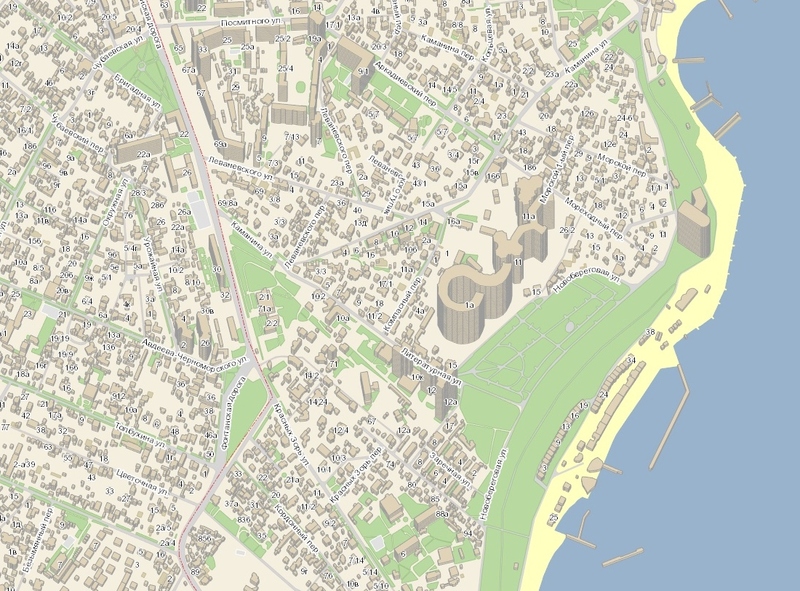 In his memoir, A mosaic of life, Kataev wrote about all the streets his family lived on during his childhood, Bazarnaya, Kanatnaya and especially Otrada, the little group of streets at the edge of the steep lanes down to the sea. An area that had once been a fishing village was being colonised by the wealthy, and, more recently, by the growing middle class. 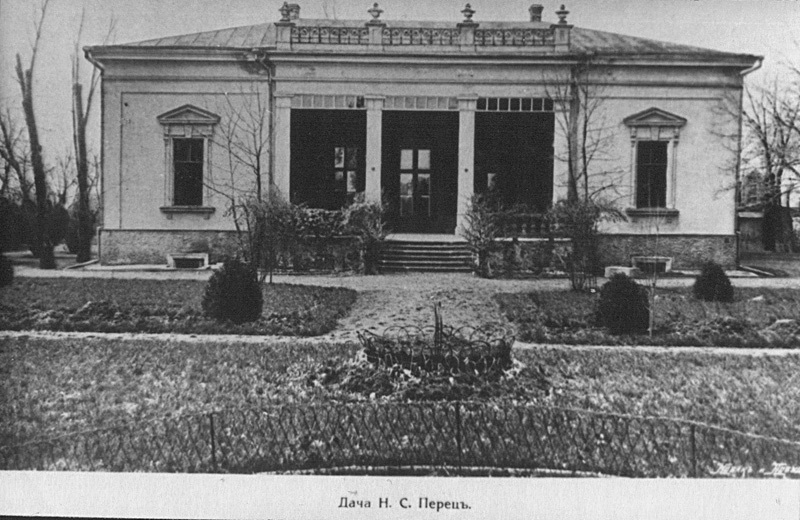 In 1910, the Kataevs lived in an apartment at Otradnaya 10, and one of their neighbours was the very wealthy publisher and printer, Fasenko. Kataev describes his friends and the games they played on the Otrada streets, including exploring empty dachas, and playing in new partly-built houses. Not all the houses around Otrada were mansions or apartment blocks. 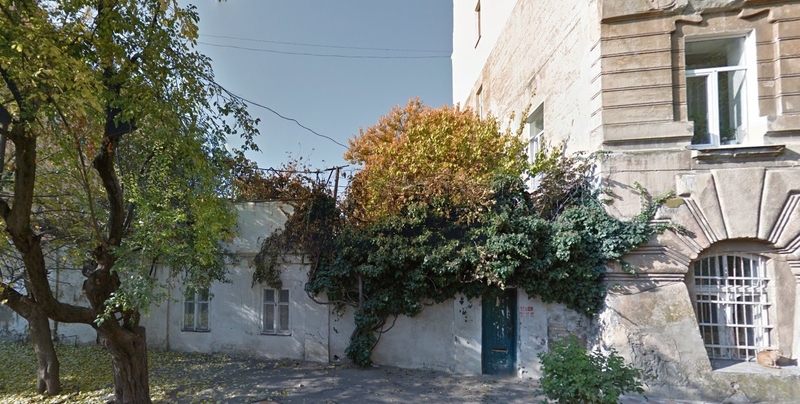 Quite small one and two-storey houses, with gardens and vegetable plots, sometimes nestled between much larger buildings on the lanes that slope down to the sea off the French Boulevard. 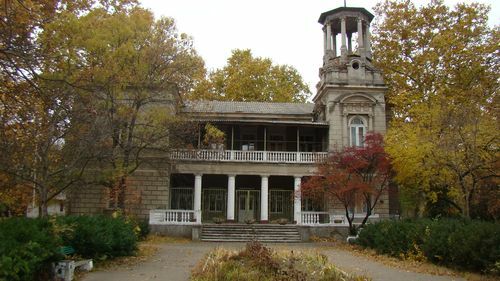 Further from the centre, the streets are barely paved, and the houses, anything from an enlarged shed to a two-storey dacha, are set back in larger walled or fenced gardens, obscured behind trees and shrubs. Kataev’s story, The cottage in the steppe, which continues from The white sail gleams, begins with the death of Tolstoy in 1910. Petya’s father makes a speech at his school in honour of the death of Tolstoy, is labelled a communist, and loses his job. He is then offered a job in a private school designed to get wealthy children through exams, but the job does not last long as Petya’s father is ethically unable to fiddle exam results as he is meant to. Eventually they try to make a living by renting a dacha at Bolshoi Fontan with several acres of fruit trees, and with the help of Petya’s friend Gavrik and his revolutionary brother and associates, they manage, just in time, to harvest their crop of cherries. The father, who is deeply loyal to the Czar, ends up teaching history, geography and astronomy to the working class revolutionaries. Before the water pipe, Odessa inhabitants collected rainwater in tanks as the well water was too mineralised to be potable. However, Kovalevsky spent so much money buying equipment from England that he went bankrupt, and the water quality never lived up to expectations. The house itself was a five-room affair with an outside kitchen, then there was a stable, a labourer’s hut, a rain-water cistern and a shed which, Auntie said, held the wine press. I imagine my grandparents living in one of these villages, probably close to or on the edge of Odessa, as my grandfather was setting up a business, possibly one of the houses set behind a picket fence on an unmade lane. 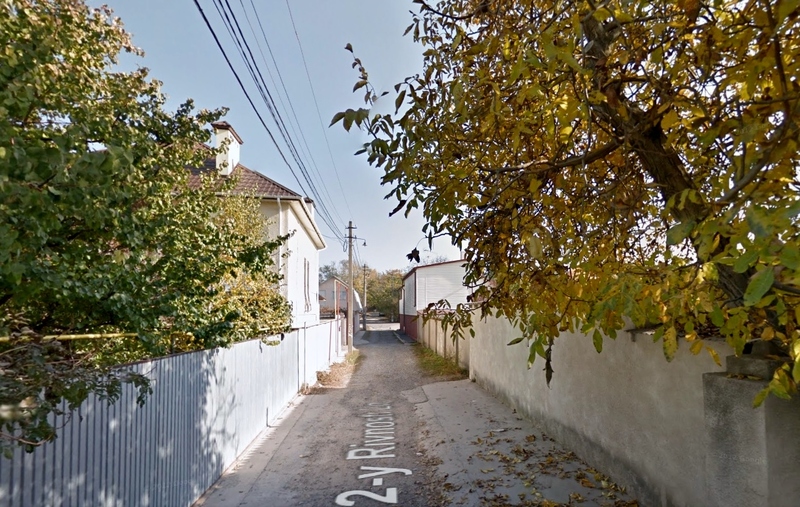 On Google Streetview, I have wandered down the little side streets in Sredni and Bolshoi Fontan looking for areas which have not been completely rebuilt. 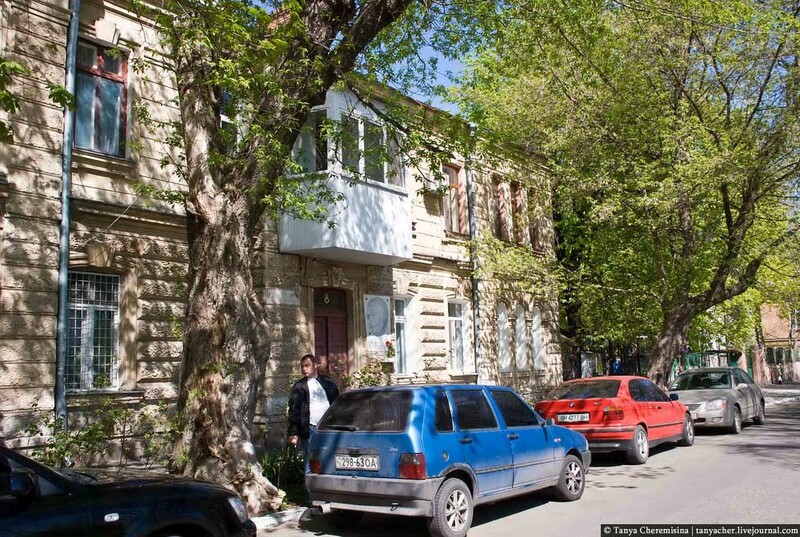 There are scattered modern apartment buildings, but mostly the area has been rebuilt with modern individual houses with brick, metal or rendered block walls or garages along the road so little can be seen of the houses. 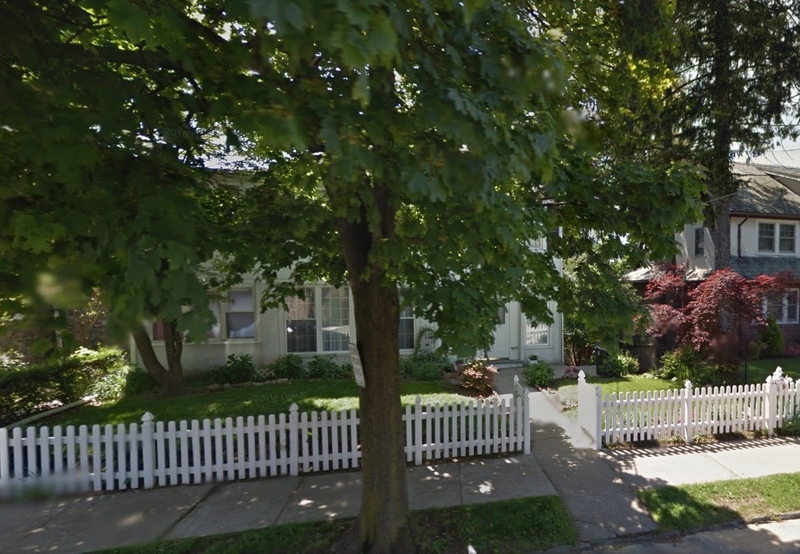 The older houses tend to have wooden picket fences and are often blocked by overgrown shrubs and small trees. 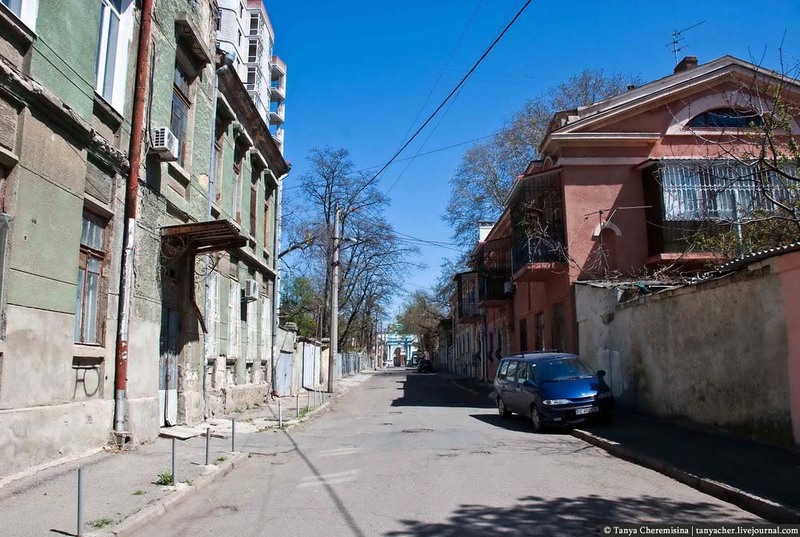 I can only imagine what the daily life was like in Odessa for those who lived in the scattered houses and villages, and what their houses looked like inside. 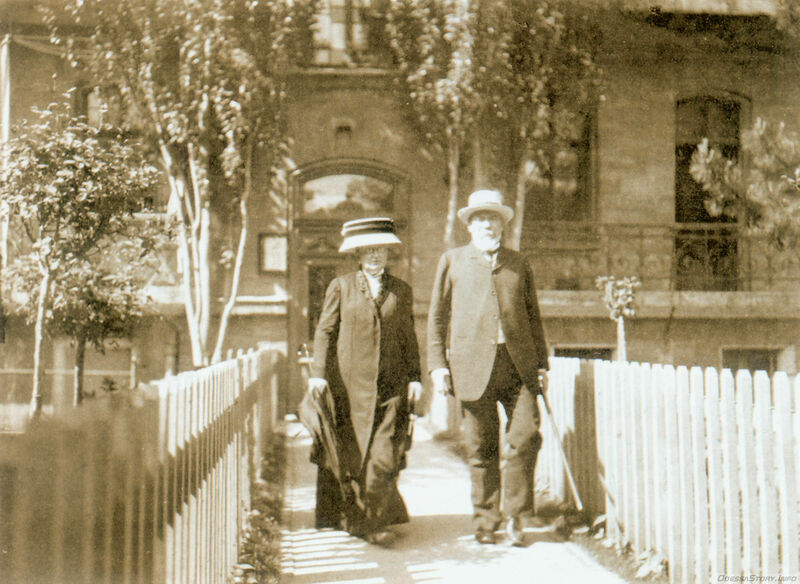 Like many of Odessa’s suburbs and outer fringes, these were city people but not city people. 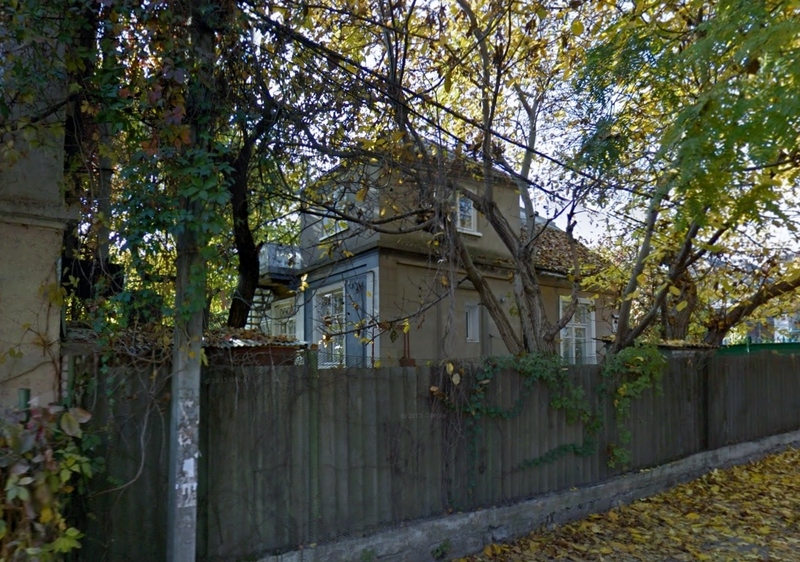 One of my older cousins spent her summers with my grandparents at their house outside New York in the 1930s and said the house was unremarkable and had ordinary, non-descript furniture, although there was also a samovar, and my grandparents drank their tea from Russian glasses and cooked typically Russian food. The only photograph I knew as a child of my grandparents was taken by my father in 1935, my grandfather in his old-fashioned three-piece suit, and my grandmother dressed like an old peasant woman in a long checked cotton skirt, careworn, and haggard, not what would have been expected from her middle-class background, or in a photograph of any woman in her 50s in 1930s New York. In Odessa I imagine they had typical furniture from the 1890s, flowered or striped wallpaper and little tables covered with vases, decorated boxes and family photographs. 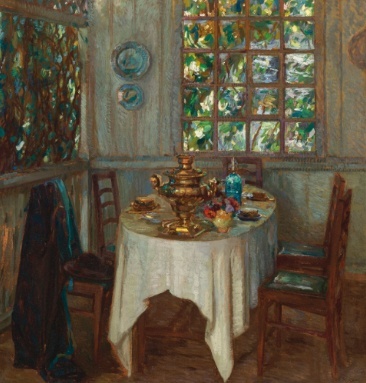 It is difficult to find photographs of interiors from the 1890s and early 1900s and the impressionist or art nouveau paintings of the time are abstracted or highly idealised. Two of the paintings below have dates and the other is more modern. 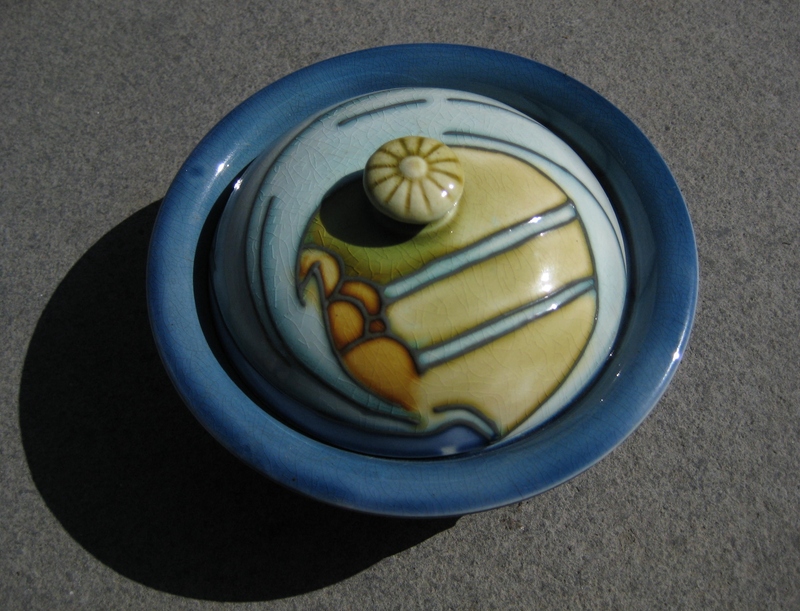 I have one object that my mother said her mother had brought from Russia, an Art Nouveau Minton soap dish, which would have come with a complete wash set of bowl, jug, sponge dish and chamber pot. My mother may have invented the story that the soap dish had been her mother’s or had come from Russia. Her mother may have acquired it in New York as my grandfather was a scrap dealer, but as I discovered many years after I tried to date the dish, it has a number, a tiny 3, on the foot which signifies 1903, placing it exactly when my grandmother might have bought it in Odessa. Most similar Minton Secessionist ware is not dated and could have been made any time from about 1900 to 1920. That this dish is dated 1903 is most intriguing. It suggests that my grandparents may have had a taste for modern Art Nouveau furnishings and may have had some beautiful things. It is a strange fragile object to have survived their trip from Odessa to Minsk (possibly stopping for some time in Kiev to have their baby) to Liverpool, and then finally to New York. 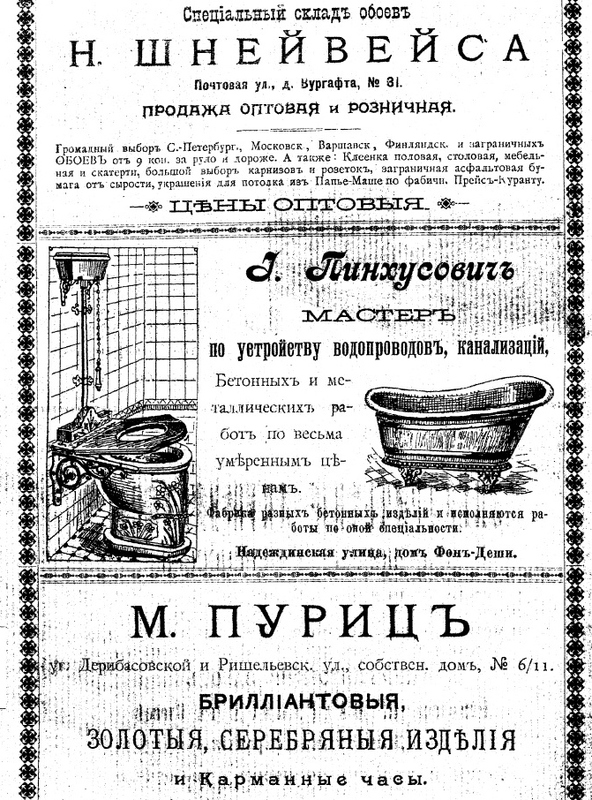 Washing apparatus was very important for Russian travellers, especially those with babies, but travellers would have carried small tin (or silver) soap boxes. A ceramic soap dish must have been packed deeply in their luggage. Because Russian inns tended to be primitive, and distances were so far, travellers also carried tea making equipment and bedding. I imagine this is why most immigrants often speak of their families having brought their samovar, feather pillows and quilts from Russia. It is difficult to imagine my grandmother with her beautifully dressed babies (photograph in Rabinovich birth records and the pogrom https://odessasecrets.wordpress.com/2016/01/13/rabinovich-families-part-two-birth-records-and-the-pogrom/), her Ukrainian maid, and her Art Nouveau wash set, when, to me, she was the tiny careworn peasant in my photograph. It was not until many years later that I was given a photograph of my grandmother with her parents as a 16-year-old, a middle-class girl in 1889,with her life ahead of her. That is the only photograph I have of her taken in Russia, leaving her early married life with my grandfather and the first years of their first four children a mystery. Michael Ignatieff, in The Russian Album, has a similar late picture of the Russian grandparents he never met, who had been brought up in mansions, standing in the snow in bedroom slippers outside their small bungalow in Canada. The photographs of his and my grandparents are photographs of people who have had to leave their homes, who have been emigrants, emigres, refugees and finally immigrants, but have never truly found a new home. When I began this research, I did not know whether my uncle Michel was born before or after the pogrom, as his date of birth is not on his death record or anywhere else. But there was one more clue which helped me to put the pieces of this story together. One of my cousins told me a story about the oldest son, Aron, who was seven when they left Russia, and who had nightmares all his life from having seen ‘Cossacks spearing Jewish babies’. He never spoke of the past or his childhood, but did explain about his nightmares to his wife, saying that when there were raids in his village, their Ukrainian maid, who had a Cossack boyfriend, would warn them, and the children would be hidden. What did he mean by village? Where might they have lived? How many raids might they have experienced? Where were they hidden? 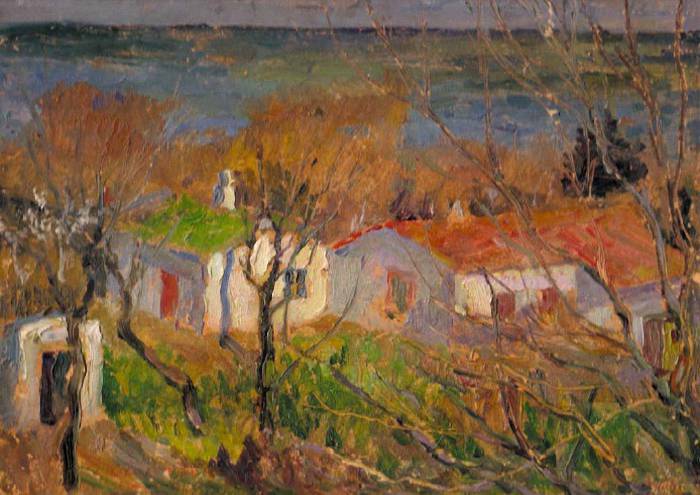 In his memoir, Mosaic of Life, Kataev also uses the word ‘village’ when his family moved just a few streets from their home on Kanatnaya to Otrada, a group of four short streets which had originally been a fishing village on the edge of the steep lanes down to the coast. 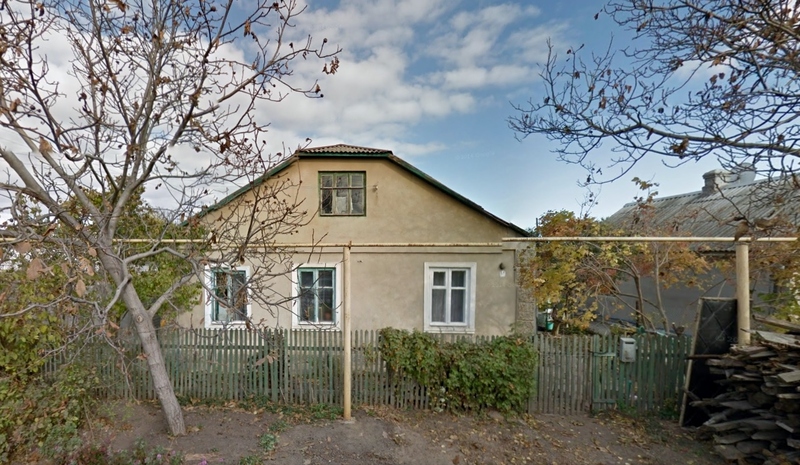 I began to think about my grandparents living on one of the small lanes running down towards the sea or at one of the fishing villages used as local resorts, the Malyi, Srednyi, or Bolshoi Fontan, and I wandered along Google Streetview, looking at the old houses that remained. If Michel was not born until after the pogrom, the two nameless boys would have been the youngest, possibly under 1 and 2 years old in 1905, and it would not have been possible to hide them away with the older children. They would have been in their mother’s arms, easily grabbed away by soldiers. If Michel had been born before the pogrom, this story falls to pieces. 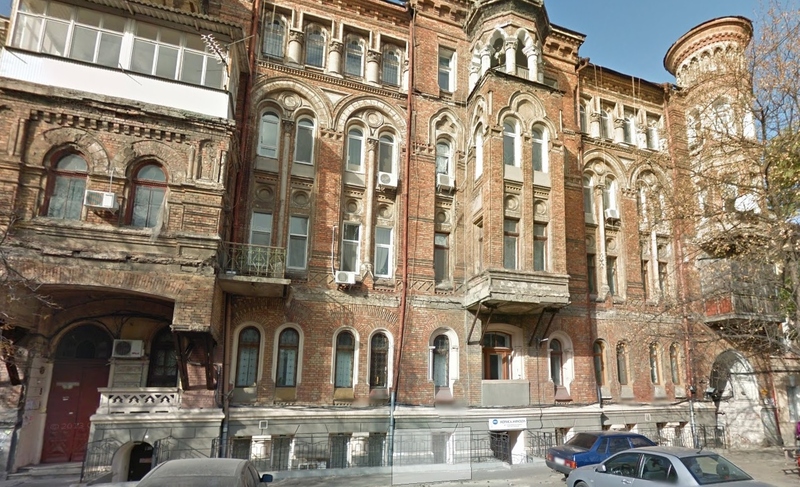 But recently I asked a researcher in the Ukraine to look up three Odessa birth records for me: the two Mikhails born in 1905 (there were no Mikhels), both born after the pogrom, to see if any were my uncle Michel, and one Nakhman born in 1904, as that was a family name, and might have been one of the other boys. I found that Michel was not born in Odessa, unless it was during or immediately after the pogrom and the family did not have a chance to register the birth. 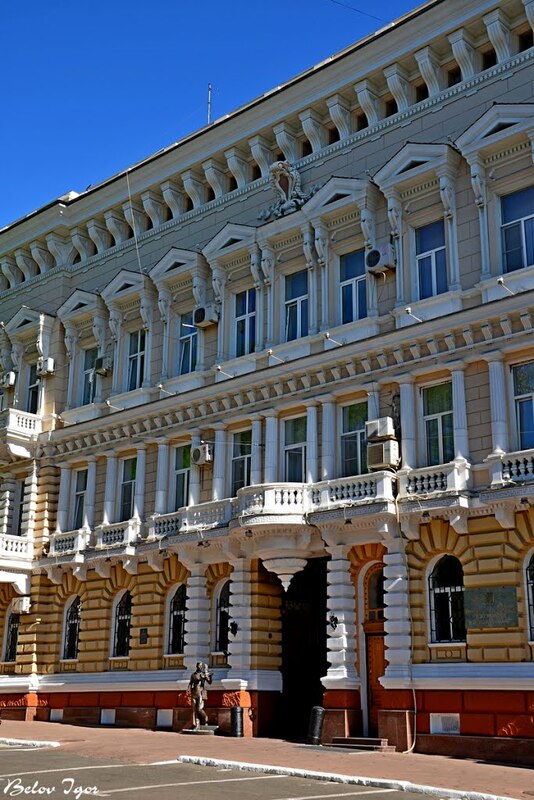 The real children of the Odessa birth records I received were one Mikhail, son of an Odessan businessman Abram-Ide Khaskelecich, Nezhinskaya St 14, born 18 November 1905, another Mikhail, born 30 November 1905, son of Hersh Leibovich and Ester from Satanov, and Nakhman, son of Abram Shimonov and Zislia from Kherson, born 14 December 1904. The stories about my uncle Aron also say the nightmares were the result of witnessing a baby being tossed into the air and stabbed with a sabre. A slightly different version of this story was that he had seen Cossacks riding into their village, taking small babies out of their mother’s arms, tossing them into the air and spearing them on their swords. This made me wonder where Aron and his sister had been hidden that he could see this scene. At first I had imagined he was looking out an attic window at some distant scene down a street, but of course it is more likely he could only see in front of his own house. Later, I began to think that they might have been in a shed looking into their own yard, or a cupboard in their house looking through a keyhole. Both stories mention babies, as do many others newspaper stories about the pogrom, but there are no babies in the pogrom death records and only 3 children under three years old. If the two brothers had not died in the pogrom, why would my grandparents have gone to so much trouble to hide any evidence of them, to hide the birthdate of their youngest son, and everything else about their lives in Odessa? It was a very elaborate lie to keep going for the rest of their lives. The 1910 US Census has a question about the number of children a woman has had and whether they are alive or dead. In 1910, four years after they arrived in New York, my grandmother had had her first child born in the US, and she said she had had four children, and four were alive, the three that had come from Russia and the new baby. Why had she not said she had had six children, as she did on my mother’s birth certificate? 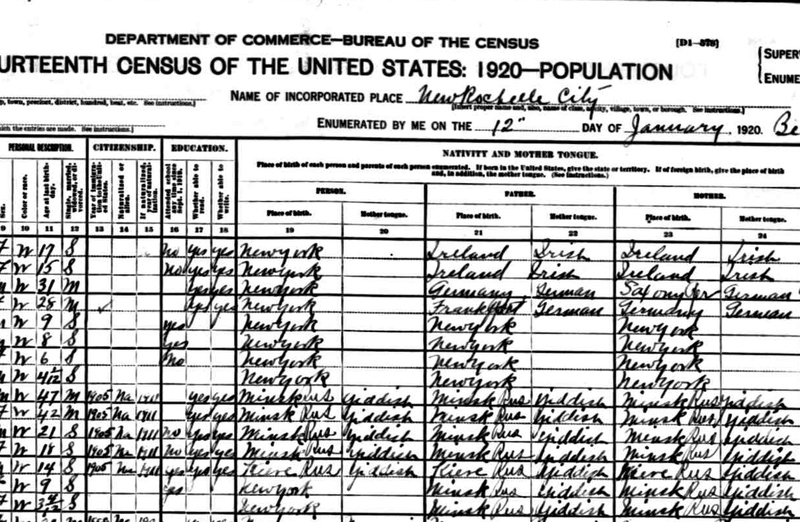 I wondered if the census was done orally with the whole family around, and my grandparents did not want to mention the two missing children in front of the others. 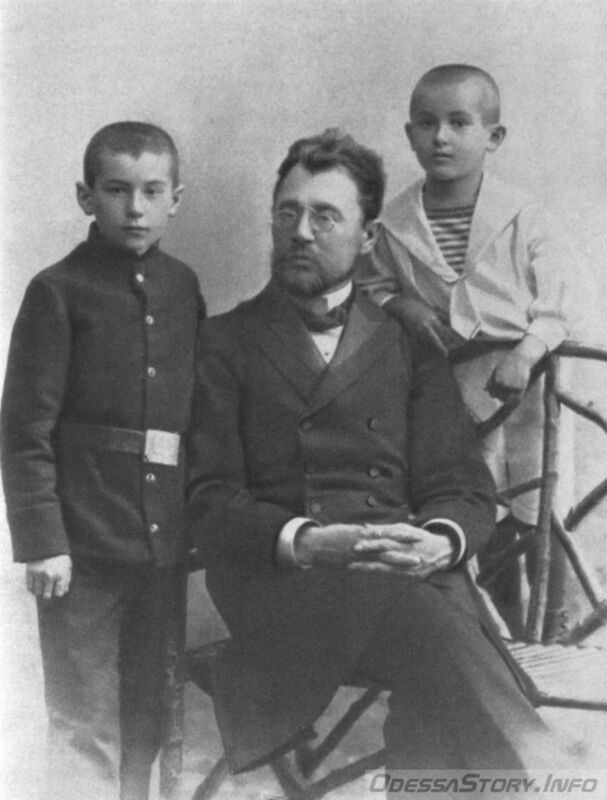 Michel was then 5, old enough to understand everything, and may not have known about the missing brothers, or anything about the circumstances of his birth and why the family left Russia. This might have been a lesson for the children that the past was not to be spoken about. And a problem for them later. 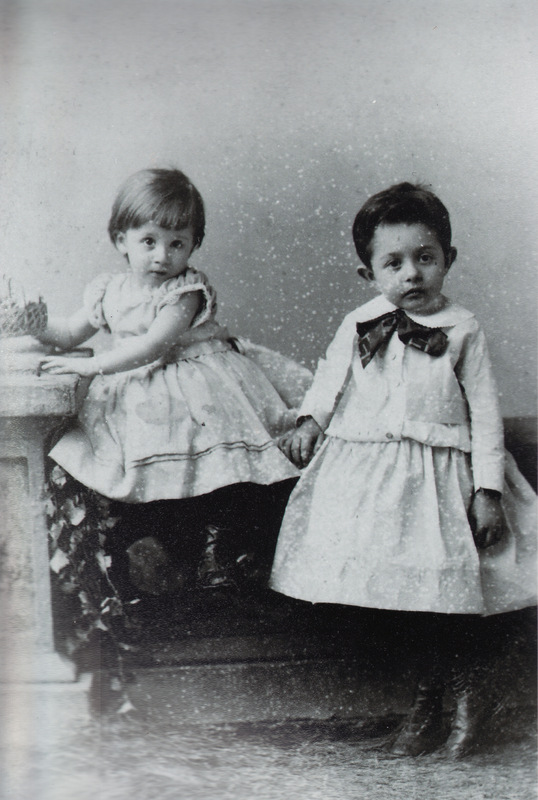 I have a photo of the two eldest children, Aron and Sara, when they were nearly 2 and 4, as Aron was born in December 1898 and little boys began to wear trousers by 4. It might have been taken shortly before the third child was born in Odessa, or before they left Baranovichi. 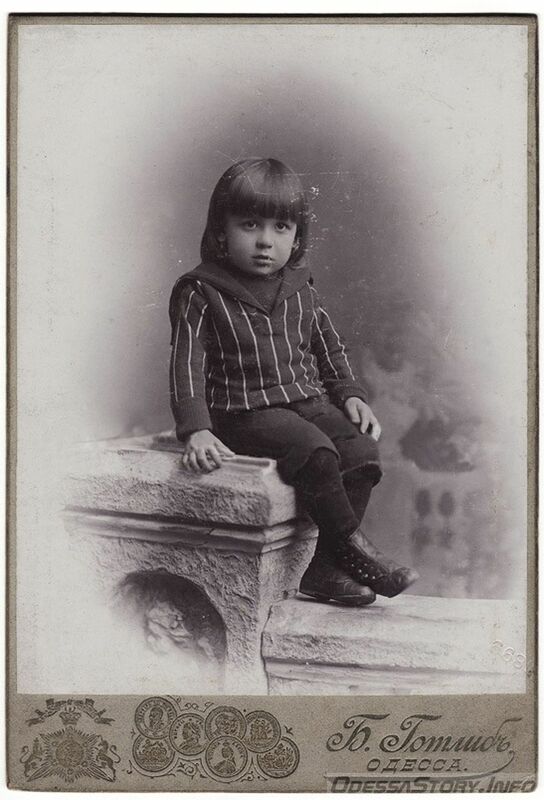 Studio portraits of children leaning on props such as walls were very common in Odessa at that time. It looks as if someone has made a copy of this photograph cutting out the name of the photographer and town at the bottom. 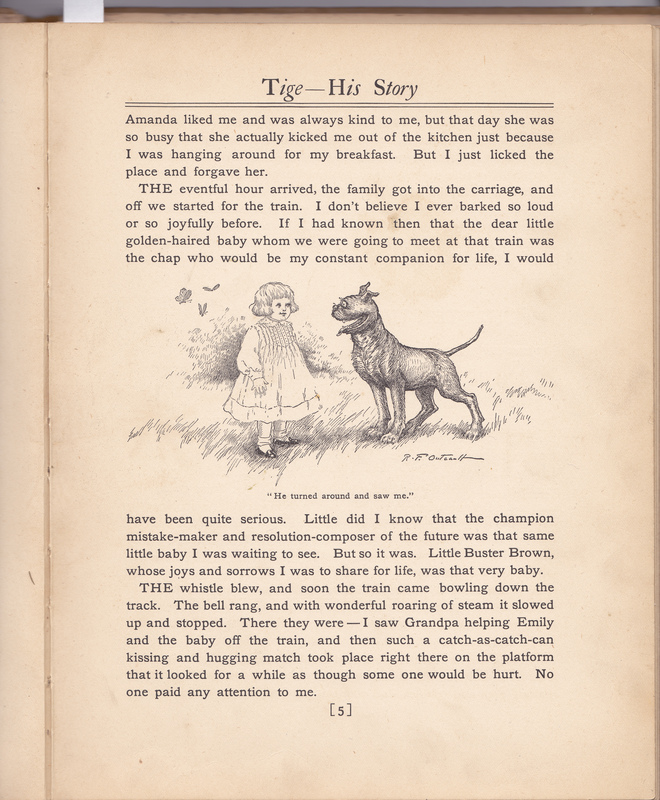 When I was 6 or 7, I remember finding an old children’s book, Tige, among my parents’ books. 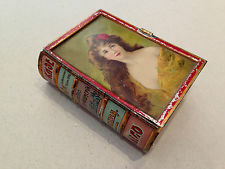 I assumed it had belonged to my mother when she was little, although it was never mentioned and I never thought to ask. It is the story of a dog who moves from the country to live with a little boy and his family in New York City until the family finally moves out of town to a house with a garden, much to the dog’ s delight. In one of the first pictures, the little boy is dressed in a dress, as my uncle was in the photograph. It was not until recently that I thought to look at when the book was published – the date inside is 1905, and I realised that the book must have been for Aron, who was seven when the family arrived in 1906. The story mirrors my grandparents’ lives at that time, as they settled first in Manhattan and then moved out to New Rochelle. Had he been given it for his first birthday in America around Christmas 1906? I am quite sure that my grandparents would not have bought a book in English, a language they never learned to read or write properly. 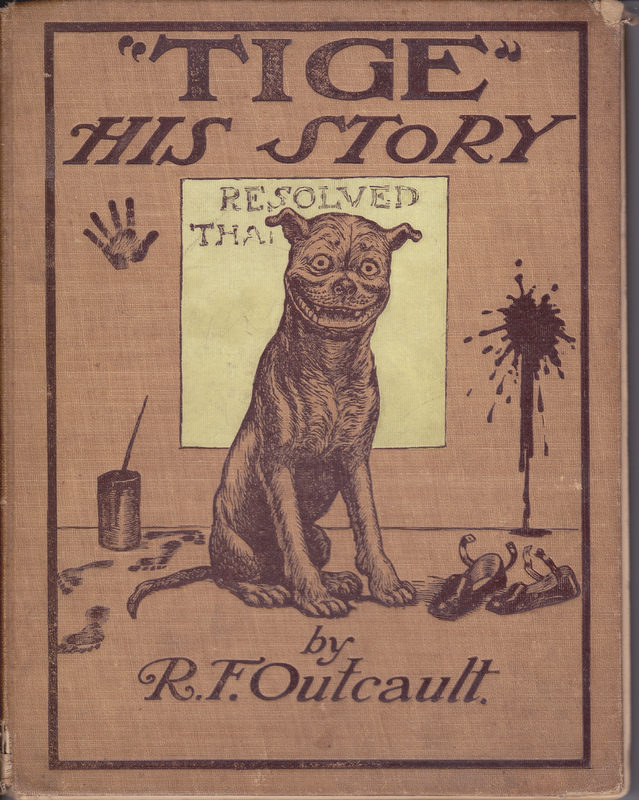 They would not have known that this story was a spin-off from a popular cartoon called Buster Brown. Was it bought by one of my grandmother’s brothers, the successful one who had had several businesses and was always helping out other family members? I doubt that there were many other books or other things in the house at first, so this is a rare reminder of their first months in the US. This is the only photograph of my grandparents’ children in Russia. When I read Ignatieff’s description of the death of little Paul, it makes me wonder how my grandparents might have felt losing two little boys, possibly from an illness like typhoid, but possibly brutally during the pogrom. That these two boys remained nameless and no photographs were kept probably says more than any number of words. The first family photograph taken in the US was of my grandmother and the three children about two years later, when the baby, Michel, was about 3, wearing a dress as had his brother before him. The children are not as smartly turned out as six years earlier, or as most children are in studio portraits. Their clothes are rumpled and not tucked in. The little touches of a mother wanting her children to look their best are not there, although everyone, except the youngest who looks up quizzically at the photographer, is smiling. From the little I have heard about my grandmother, I felt that something had been broken in her by the time she reached America. I gathered that she rarely went out anywhere, whether to the shops, into New York City, on a holiday, or to visit relations. My grandfather mainly worked from home or very early in the morning so that he could be at home for lunch with my grandmother, and once settled, she did not want to move or change their life in any way. And even though my grandfather was often around, when my mother, the youngest child, went to college in New York City, she felt she had to come home for lunch as often as possible because her mother was now alone. My cousin also mentioned that, in the summers, my mother would come from work to her mother’s for lunch, and then take her and my cousins to the beach, where my grandmother would sit by herself rather than talk to the other old women gossiping together. 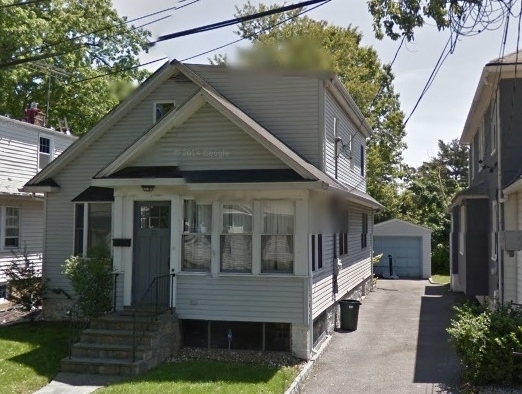 My grandparents always lived on the same two adjoining streets in New Rochelle but none of the houses they lived in remain. 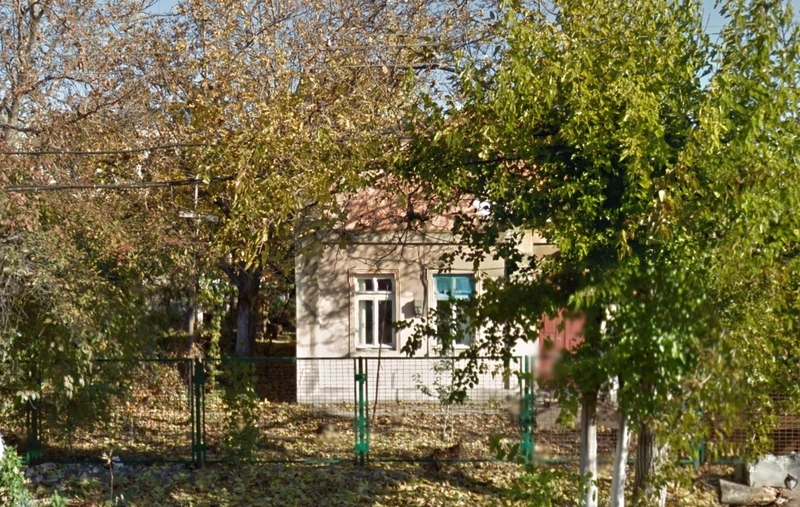 Many of the houses around there do not look that different from Russian houses with their gable ends to the road, picket fences and tree lined streets. There was one more clue to where all the children were born. In the US 1920 census, the Russian districts where people were born were recorded. My grandparents and the two elder children were said to have been born in the Minsk district, and for Michel it said Kiev. My grandfather also wrote on his naturalisation form that his last residence in Russia was Kiev. It is possible that they had left Odessa and stayed initially in Kiev to have the baby and wait until he was old enough to travel on to Minsk and then America. But it is also possible that, not wanting to speak of why they had left Odessa, they invented the story that they had lived in Kiev. When my eldest uncle applied for his first US passport around 1960 he wrote that he was born in Kiev. Was he not born in the Minsk district or had he simply decided to repeat the Kiev story? I was still not sure where Michel had been born, and no closer to finding the other two uncles. Eventually, as more records come online, possibly even added to this blog from people who have retrieved records from the Odessa archive, this list will be wheedled down to a point where it might be feasible to find my uncles. Below is a list of the Odessa Rabinovich births for 1902-1904, among which are possibly the two missing boys. In order to think more about where my grandparents might have lived, I returned to Kataev and his description of the pogrom hooligans leaving his apartment and heading out of town towards the road to Mali Fontan (later Frantsuzky or French Boulevard, Французький Бульвар), towards ‘Malofontanskaya and the corner of Botanicheskaya’. 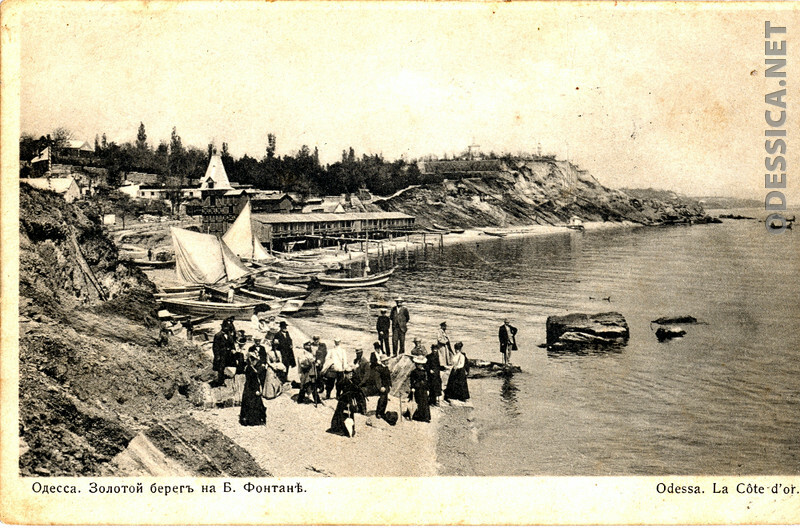 This was the beginning of my imagining my grandparents’ life in Odessa and my first intimation that the pogrom had moved out of the city and onto the road towards the resorts, dachas and fishing villages that lined the shore. 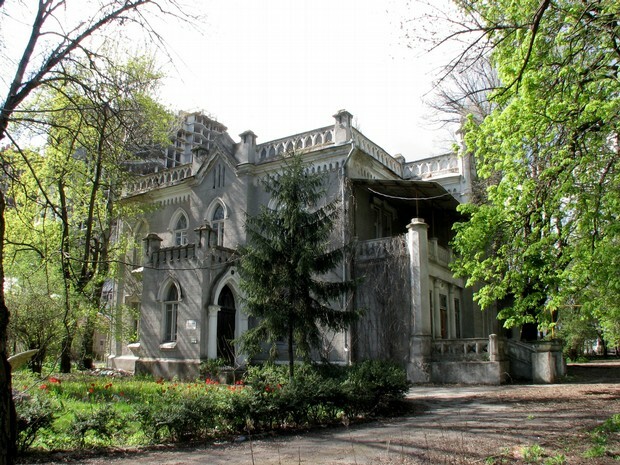 Using old maps, websites with the history and photographs of Odessa streets, and Google Streetview, I followed the hooligans on their route out of town down Malofontanskaya or Frantsuzky Blvd, with its mostly elaborate mansions of Russian aristocrats and Jewish merchants interspersed with more humble dachas. I stopped at the corner of Malofontanskaya and Botanicheskaya, where it once had beautiful dachas surrounding the Botanical Garden area. In this close-up of the city, the railway station and Kulikovo Field are in the upper left and Frantsuzky Blvd is the road running top to bottom on the right. 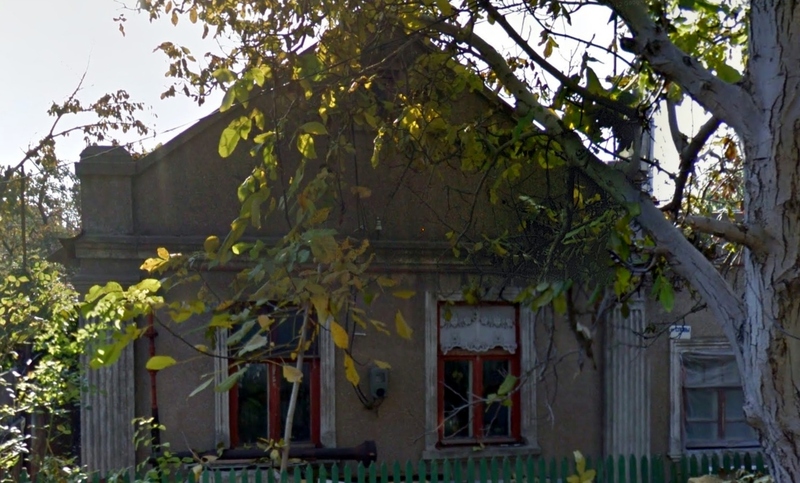 The corner with Botanicheskaya (Botanical Garden St) is the street joining Frantsuzky Blvd at the letters Валт (дача Валтух, dacha Valtukh). 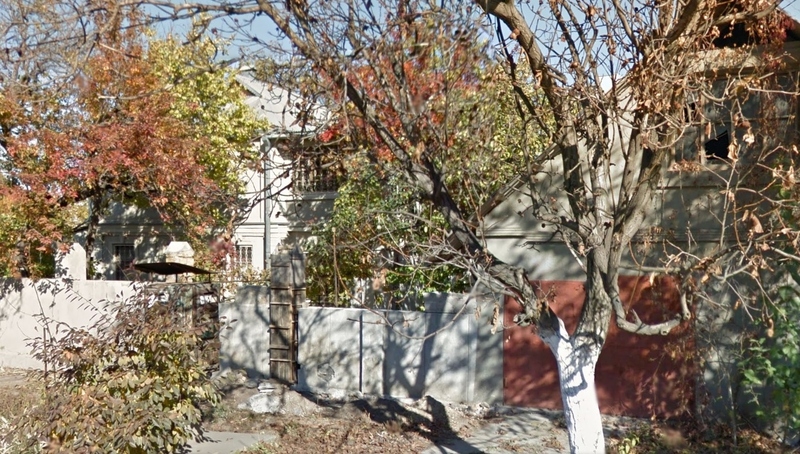 This was 35 Frantsuzky Blvd, a very large plot of land, some of which had been sold, where there was a more modest dacha owned by a rich Jewish merchant, Usher Moshkovich Sigal, owner of a brickworks, ceramic factory and shop. 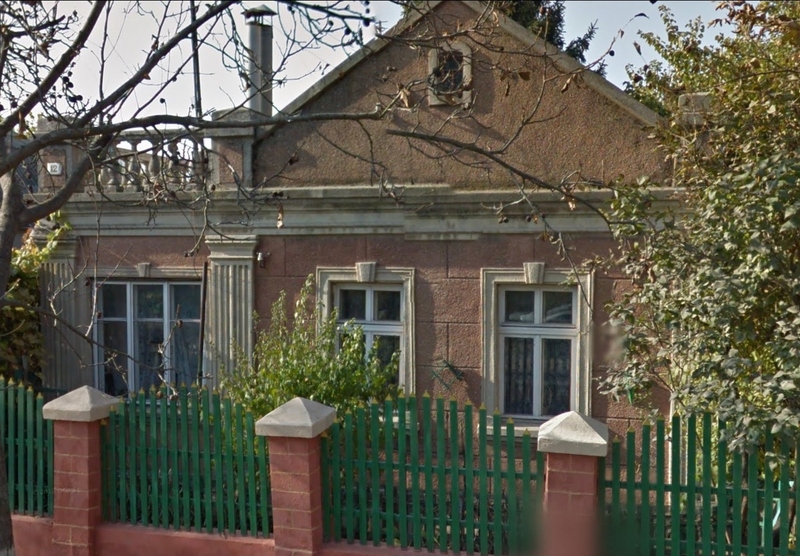 He also had a large house in the Moldovanka area. 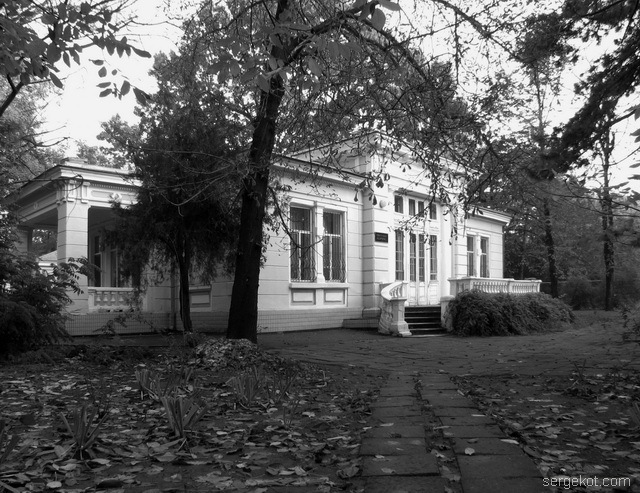 Near Sigal’s dacha were two much more majestic summer homes: at number 31 lived the Demidov, Prince of San Donato (Демидов, князь Сан-Донато) family and at number 37 was the very ornate Dacha Makaresko. Other nearby dachas were the equally elaborate. On the other side of the road near the corner with Botanicheskaya there were also dachas in large parks, though they did not have grounds leading down to the sea. Mostly now there are new apartment buildings on this side. 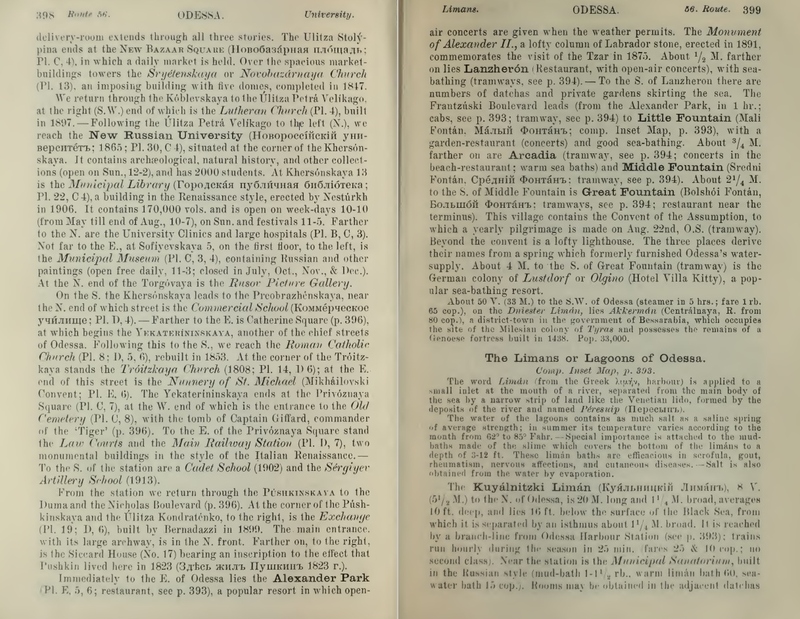 In the directory, there were a few obvious Jewish names such as Grossman at number 16 and further down, Rapoport at number 26. The hooligans may have been going to any of these Jewish dachas. 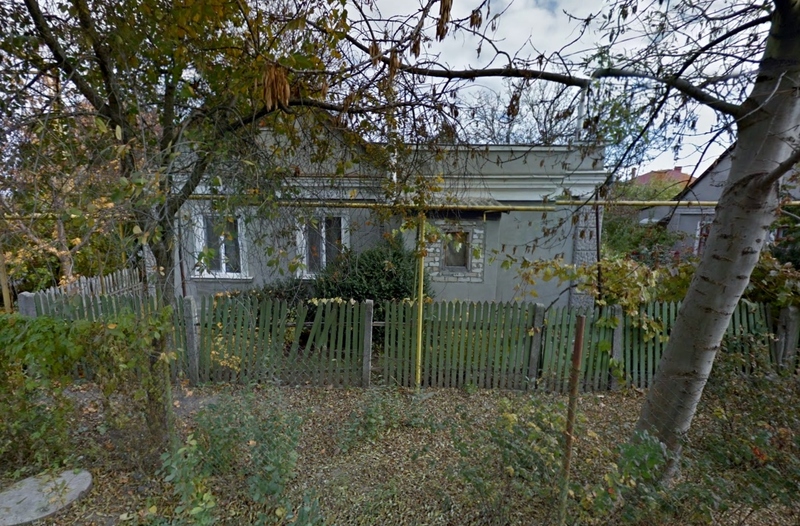 Other examples of the dachas on that side of the street are Dacha Perets at number 22 and Dacha Tseiner at 28. 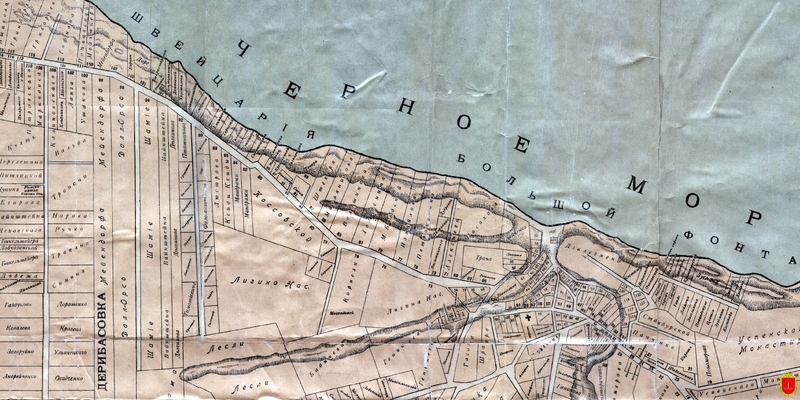 After doing their damage, the hooligans may have continued down the Malofontanskaya, coming first to Mali Fontan and then may have moved on to the Sredni and Bolshoi Fontans, about 3 miles down the coast according to the 1914 Baedeker. 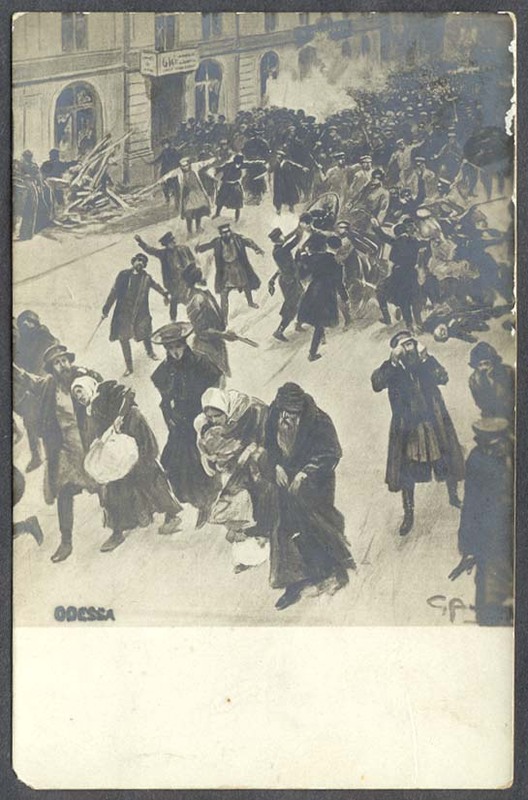 In The Odessa pogrom and self defence, 1906, there is a chapter called ‘The journey of grief’ about the pogrom reaching the furthest resort, Bolshoi Fontan. 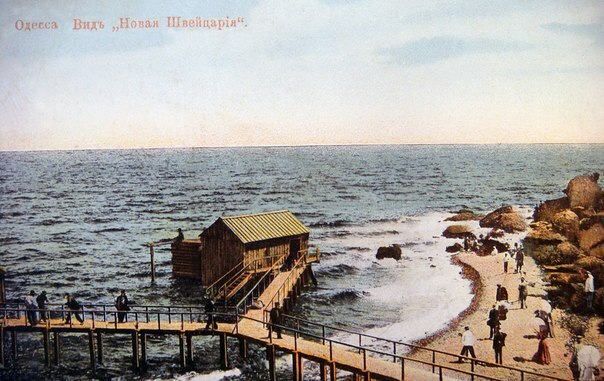 The fishing village, Bolshoi Fontan is a place of lively dachas in summer, but by autumn there were only about 10 families living there full-time. On the Wednesday the rabble arrived wanting to crush the Jewish homes, and the Jews, realising that things were getting desperate, decided to band together. 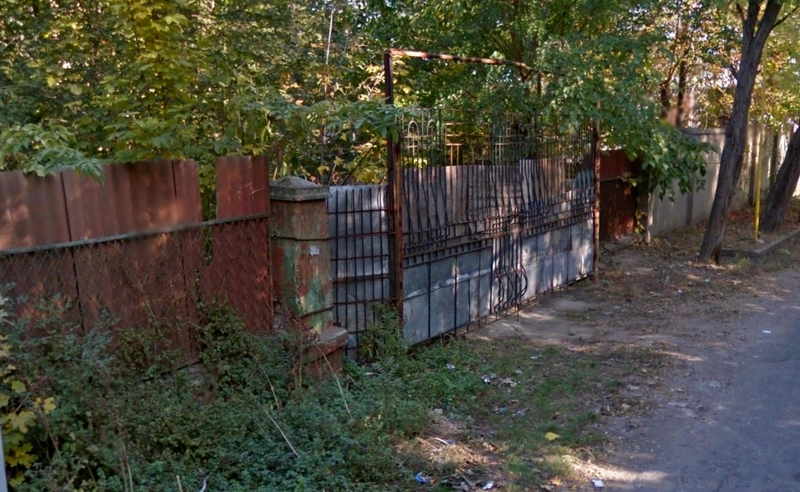 One family went to the German gardener of a neighbouring dacha belonging to the wealthy Ksida family. The German agreed to hide them in the greenhouses, until a few from the village arrived and told him that they would destroy the dacha the next day if he didn’t throw out the Jews. The Jews met with the gardener and decided that the first family to arrive would stay but the remaining 25 would leave the dacha, which might save the gardener. It was night and a journey of grief for those who left. There was a cold autumn rain and the sea was stormy. 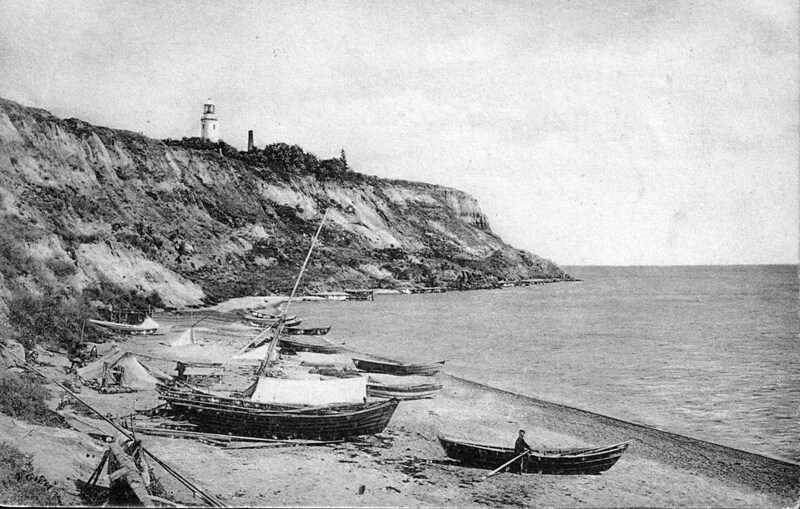 The shore from Bolshoi Fontan to Langeron (near Odessa) had been washed away. In the day, the broken, fragmented cliffs with the dachas above are beautiful, but one needed to be young and agile on the slippery, twisting clay goat- path. They tried to get to the Shveitsari shore, but by night the path was difficult for families, hungry and not dressed in the right clothing, and everyone was in despair. They were going in the direction of Odessa, from where the pogrom had begun. The children were whimpering, fathers gnashed their teeth, mothers pressed against their children, trying to warm them. The whole night they covered several versts along the shore and in the morning they had reached a church and asked the caretaker if he would let them in to warm themselves. The caretaker went to ask the priest. The priest came out with a stick in his raised hand and turned them away. 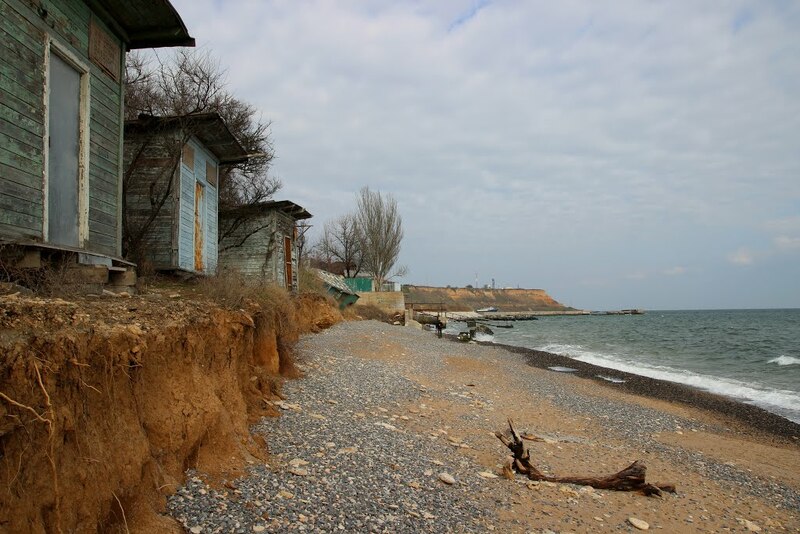 They hid again on the cliffs and saw a huge crowd coming from Odessa by the shore, destroying Jewish dachas. They went further. And suddenly in front of them was a fugitive with a gun, but it turned out to be the judge Somov (Nicholai Sergevich Somov Николай Сергеевич Сомов). The people went with him to his dacha. He kept them there for three days, giving them food and drink and consoling them; he didn’t let them go before Sunday, when the pogrom in the town had completely ended. He took them to town and thoughtfully accommodated them and gave them some money. It is even more surprising that, before, Mr Somov was considered by the Jews of Odessa to even be somewhat anti-semitic. It is only in times of tragedy that you can distinguish friends from enemies. The family which stayed at Ksidi’s did not have a less fearful experience: nearby the famous Brodsky dacha was destroyed. The German hid his guests in a pit which had recently been used to stir lime, which was covered with beams and rocks. The family were under this burial mound for several hours, while the hooligans robbed Brodsky. 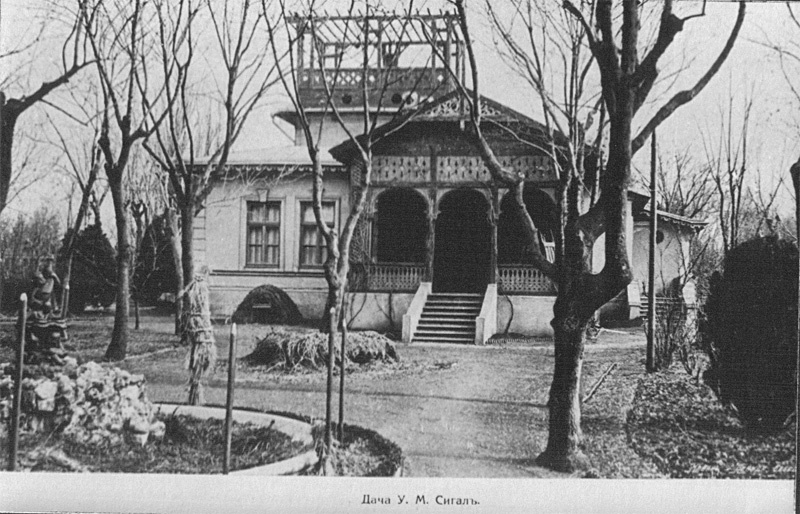 The Brodsky family was one of the most well-known Jewish families in Odessa and Russia and had several dachas outside the city. One of them was at 79 Frantsuzky Blvd. 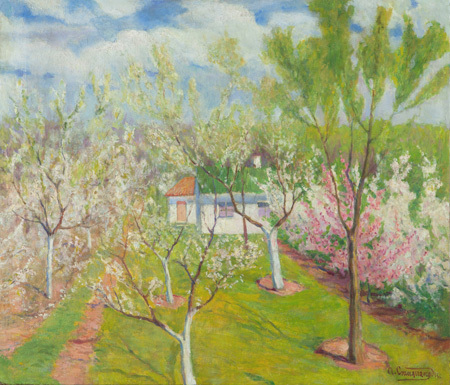 The painting of a dacha below is by Isaac Brodsky. But the families left in Bolshoi Fontan in late October, the ones who lived there full-time, would not have lived in the luxurious dachas owned by families like the Brodskys and Ksidas. 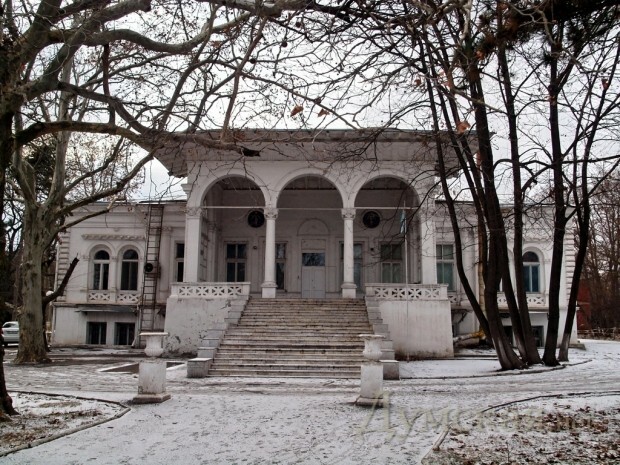 They would have lived in ordinary houses and worked locally or commuted to Odessa on the steam tram, which ran from a station outside the Kataev apartment by Kulikovo Field. 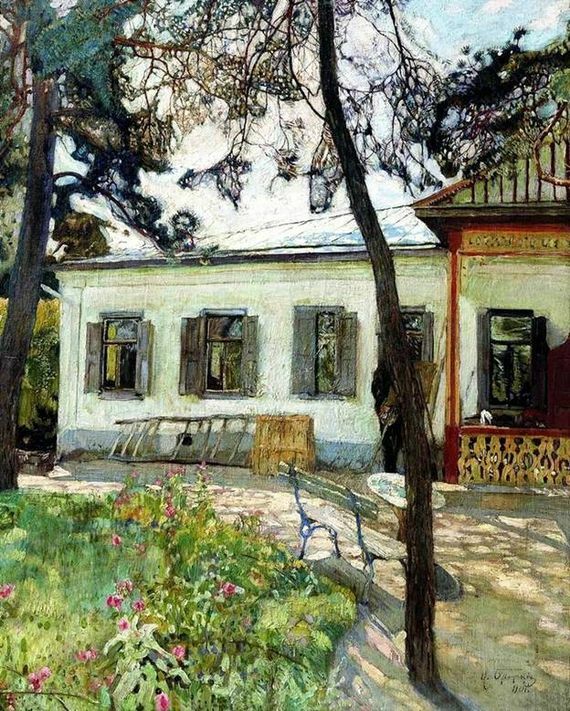 There are no photographs of the large or small dachas around Bolshoi Fontan and it is only in a few paintings that they remain. There was one person in the pogrom death records, Moishe Elev Gaber, 32, who may have lived in Bolshoi Fontan. 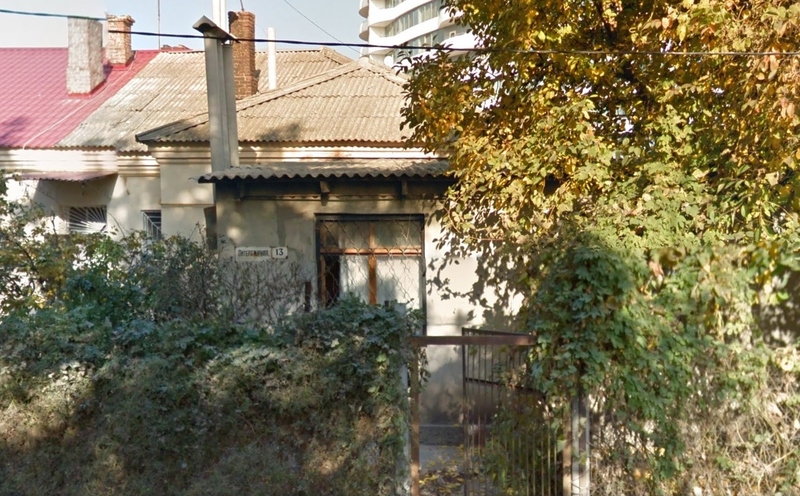 In the Odessa archives, Fond 359 Odessa office for small business, Jewish section 1893-1916, there is an Elya Iosevich Gaber, living on Naberezhnaya St 125 in Bolshoi Fontan, who may have been his father and possibly lived there full-time. The son, of course, may have been living in town. 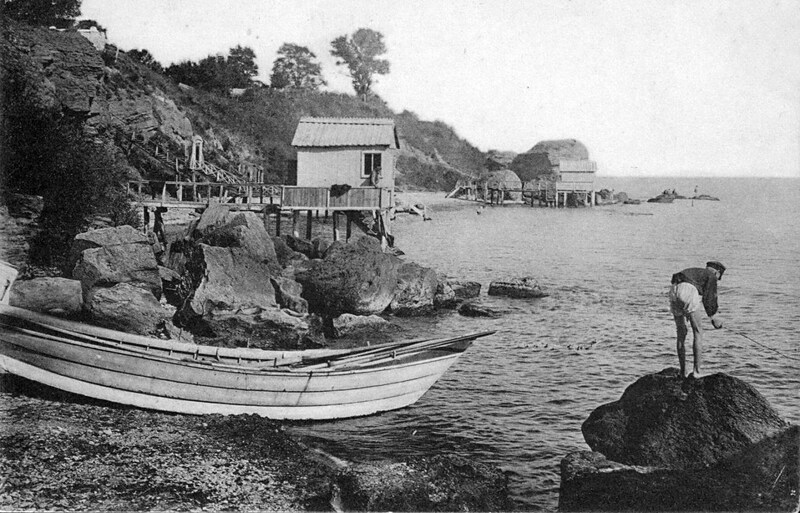 Naberezhnaya St runs right along the shore and now has small beach houses and cabins on the side of the street by the sea, and somewhat larger houses on the elevated ground on the other side. But meanwhile the pogrom was mainly raging in the working class areas surrounding the centre of the city. What was it like for people? Where did they hide? Who fled the city and what happened to the homeless? 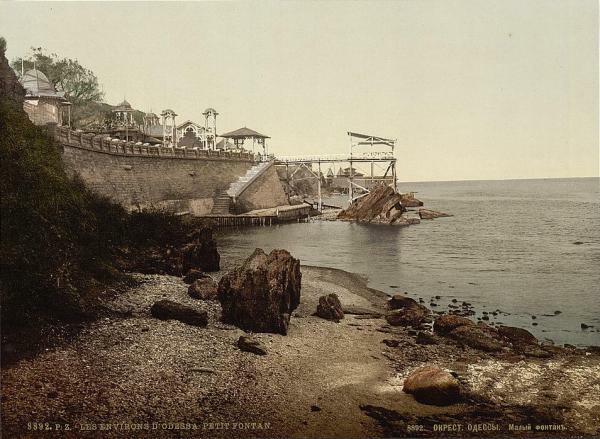 I first read about the Odessa pogrom in articles by Robert Weinberg, who uses descriptions from the Russian reports, Одесскiй погромъ и самооборона, The Odessa pogrom and self defence, 1906, http://torrentsat.org/d60271611dc36bb78e63e13da8f68d96a2f82b8e and Еврейские погромы в Одессе и Одесщине в 1905 г, C. Семенов ,The Jewish pogroms in Odessa and surrounding area in 1905, by S Semenov, 1925 http://escriptorium.univer.kharkov.ua/handle/1237075002/303. The only eyewitness accounts in English that I found were from the newspaper correspondents in Odessa or elsewhere in Russia – and between the many newspaper accounts one can begin to build up more of a picture. Immense bands of ruffians, accompanied by policemen, invaded all the Jewish houses and mercilessly slaughtered the occupants. Men and women were barbarously felled and decapitated with axes. Children were torn limb from limb and their brains dashed out against walls. The streets were littered with the corpses which were hurled out of windows. The houses of murdered Jews were then systematically destroyed, not the smallest piece of furniture being left intact. During that eventful day (first day of the pogrom) there were 120 killed and 500 wounded. During the following days the mob walked about the streets in multitudes, with the soldiers and policemen in front, and every Jew’s shop they came across they began looting, the soldiers helping them. When the Jews inside the house fired on the mob to keep them from damaging their property, the soldiers fired on the inhabitants, and then the mob rushed into the houses and killed the occupants, throwing them from the windows into the street, and tearing the children limb from limb, and smashing in their faces beyond recognition. Young women had their arms completely torn from them, and their breasts cut off, and nails driven into their bodies. Old men and women, too feeble to walk, were saturated with oil and burnt. In all, 341 men women and children were treated in this manner. The officers gave orders to bash the killed about so that no one could recognise them. No one knew if any belonging to them were killed, as the dead were taken away and dumped in a heap in a kind of outhouse attached to the burying ground. The captain of the ship went and had a look at some of the bodies, and he said it was awful, things having happened too bad to appear in print. I went through the streets where the shops were plundered. Every Jewish shop was completely wrecked, windows smashed and everything taken away. China shops have all the crockery smashed and strewn about the streets, and all the walls and windows of the houses were marked with revolver shots. Only one quarter of what has really happened has been printed. Every ship in the harbour was sheltering refugees. Looking for some eyewitness descriptions by people who had actually experienced the pogrom, when I first began this research, I wrote ‘pogrom’ and ‘biography’ into Google and found writers like Shalom Aleichem (Fiddler on the roof) and Isaac Babel. I also found some references to Mark Rothko. 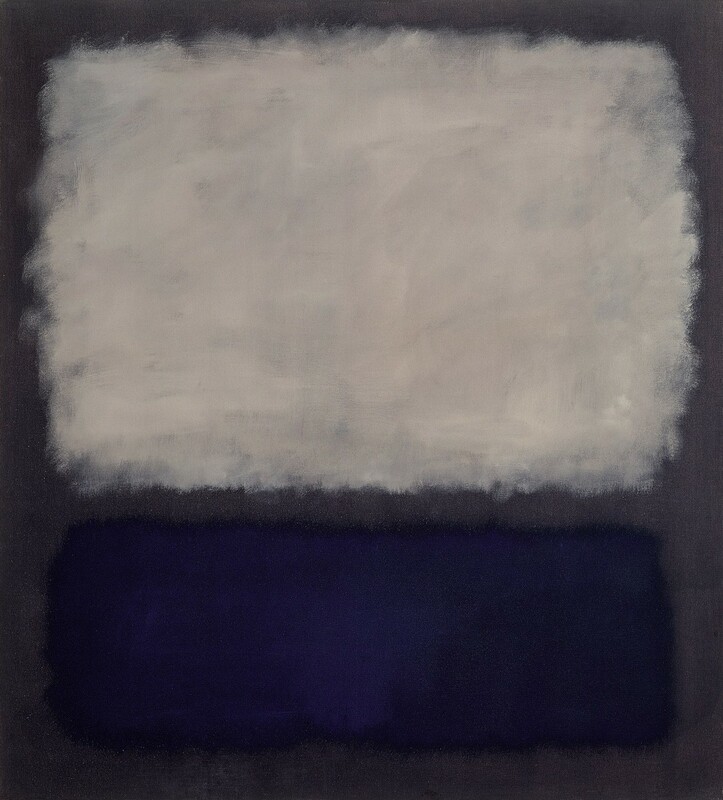 Several biographical articles about Rothko, who was born in Dvinsk, Russia in 1903, mention him telling a family story of Cossacks making Jews dig large square communal graves before they were slaughtered, which influenced his paintings. The biographies suggest that his story was not believed as they had never heard of mass graves during the 1905 pogrom. Isaac Babel was born in Odessa but brought up nearby in Nikolaev and in ‘The story of my dovecote’ he describes a pogrom of 1905 when he was nine years old. Most incredible was the contrast between the ordinary and the extraordinary. He described working very hard to get into the lycee, as there were strict quotas for Jews, but then writes of the joys of buying a new pencil case, notebooks and a school bag, experiences of so many children. On the day he goes to the market to buy doves, his present for passing the exam, he is beaten up, the doves killed, and when he gets home finds only his grandfather there, beaten to death. 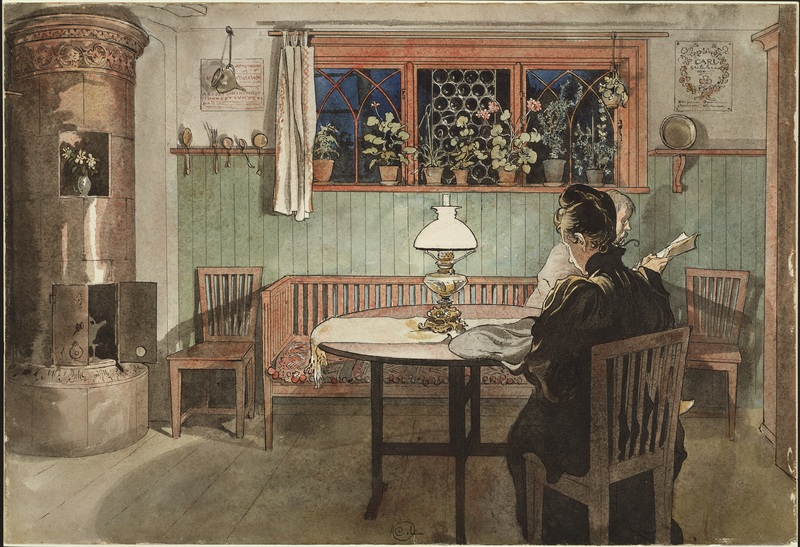 Then the scene reverts to a scene of such outward normality — his parents have taken refuge at their next-door neighbour’s and he finds his mother sitting in the glassed-in veranda having tea. It is difficult to switch between the neighbours’ normal day and what was happening to the Babel family. 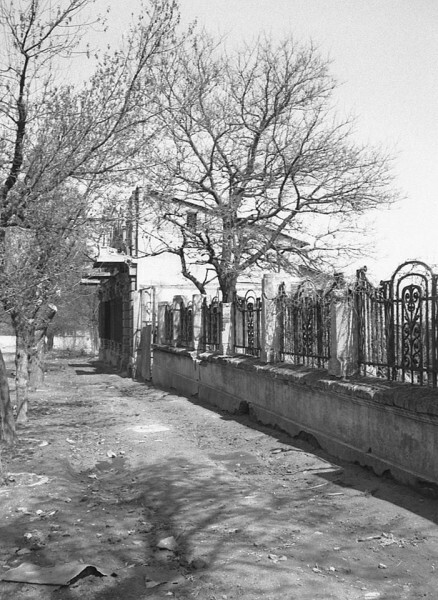 The glassed-in veranda is a long way from the traditional image of the shtetl with its poverty-stricken inhabitants, rough log houses and streets of mud, which is often the only image presented of Jewish life in Russia, possibly because it distances people from the victims of massacres. I knew that my grandmother’s family had lived in large townhouses but I had never thought of what they might have looked like. 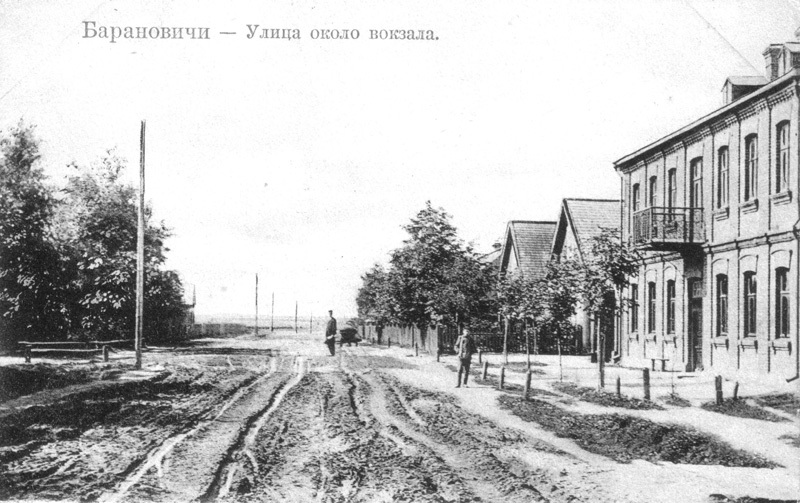 My grandmother’s parents ran a hotel near the railway station in the new railway town of Baranovichi in Belarus. I had never been able to conceive, until recently, that my family was Russian as it was never spoken about. As a small child I knew that my parents always spoke Yiddish when they got together, but I had no idea where they were from until, when I was possibly 5 or 6, I asked my mother where my grandparents were from, and she said ‘Russia’. She did not elaborate and I always assumed that there was nothing more to be said on the subject. Somehow, that one brief word was not enough to have any meaning for me, or only enough to believe and yet not believe that they were Russian. I did not meet my eldest uncle until I was 12 and by that time I knew he had left Russia when he was about seven, so the first thing I asked him was whether he remembered any Russian. He turned and left the room, slamming the door behind him, and I knew from that time that something had happened there that I was not supposed to ask about. At the time I read about Rothko, I had not read the newspaper articles about the mass graves in the cemetery of Odessa. I did not even know then where my grandparents had lived in Russia. I wondered why people doubted the story of the mass graves, and I wondered what happened to all the people whose homes were destroyed. Were there refuges, did people remain for days in cellars or attics, did they flee? Looking in the New York Times archive I found several articles on fundraising for the refugees, one of which included a letter written to a sister in New York on 27 Oct 1905 about the Odessa pogrom. It mentions “until today we have all been lying hidden in a cellar”. The next paragraph describes that after three days of burying the dead, the graves take up one half of the field “and 35 bodies are buried in one grave. Bodies are scattered all over the graveyard, so battered that they are unrecognisable. Limbs and heads of the children are strewn about. They lie in thick heaps, covered with tarpaulin. The morgues are full.” At the end of the letter, the author writes: “We find ourselves in a stable. Do not ask about food. 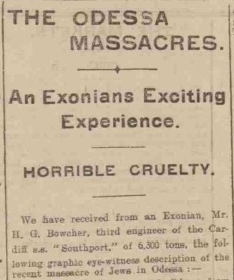 The only thing that could help us would be to take us out of this accursed land.” (New York Times 29 Nov 1905). The Jewish Chronicle had many articles on the pogroms throughout November and December, quoting from correspondents and letters from people in Odessa. Two private doctors have attended over 300 children of both sexes horribly gashed on head and shoulders with sabres…Today I visited a building containing 2500 refugee Jewish children. They were half famished owing to the scarcity of bread during the last few days. 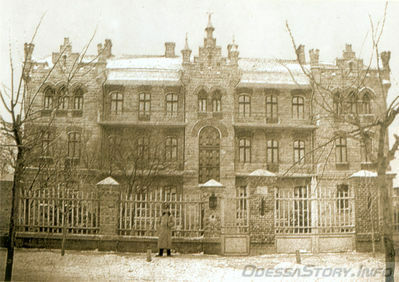 All the localities in Odessa which could be used as places of refuge were full of victims and wounded, among them the two principal hospitals, clinics of the university, private clinics, the high schools and Jewish schools. The horrors witnessed in all these places are simply incredible. 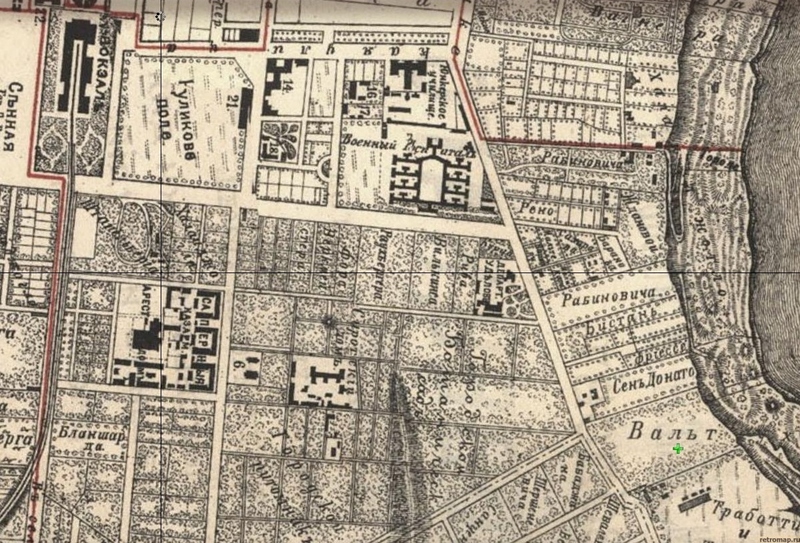 There were women who had lost the faculty of speech by shock, occasioned by the horrors witnessed and experienced, men who had been thrown from the upper stories of their dwelling houses, young girls who had voluntarily cast themselves from the windows to escape being violated, old men and infants mutilated, whole families found in cellars and attics where they had remained without food for over 48 hours. Some of the Jews fled their lives to the steamers in the harbour. Others crowded the hotels. The Jews were leaving the city, in a state of terror, many taking refuge in steamers. A train from Odessa to Kiev yesterday was held up at Rasdjelna and 12 Jews found in it were dragged from the wagons and shot. As many who had lost everything or had friends or family elsewhere were fleeing Odessa, others were trying to survive in the city, returning to their wrecked houses when the violence died down. All is quiet here today. The town councils and the newspapers have opened collections in behalf of the victims of last week’s slaughter. The municipality headed the list with $12,500 and has re-established temporary refuges and food kitchens. The losses total many millions and no less than 800 families are ruined. The Odessa correspondent of the Morning Leader estimated that 3300 orphans of Jewish victims in the recent slaughter had been thrown upon public benevolence. Over 7700 Christian and Jewish adults who have been plundered, were destitute, and were being assisted by public subscriptions. Twice that number were being temporarily sustained by their relatives and friends. 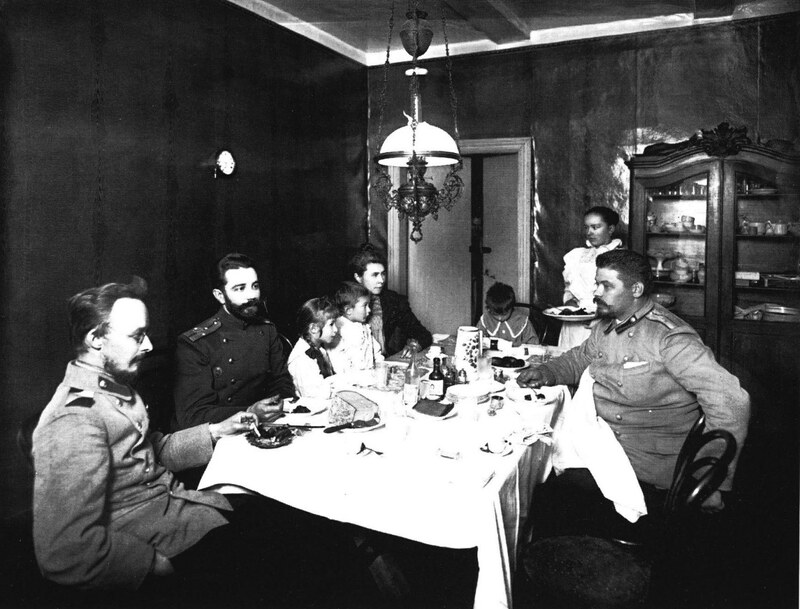 Inquiry into the working of the Central Hebrew Committee’s Relief Fund, which was originally organised to distribute aid to the wives and families of reservists sent out to Manchuria, show that 150,000 rubles were locally available for immediate distribution. Some 8000 Jewish families, over 40,000 people, nearly all of the poorest classes dwelling in the suburbs, have been affected by the outbreak. The losses, irrespective of life, comprise furniture, clothes, household goods, implements of crafts and labour, and the stock of countless petty tradesmen and sutlers. 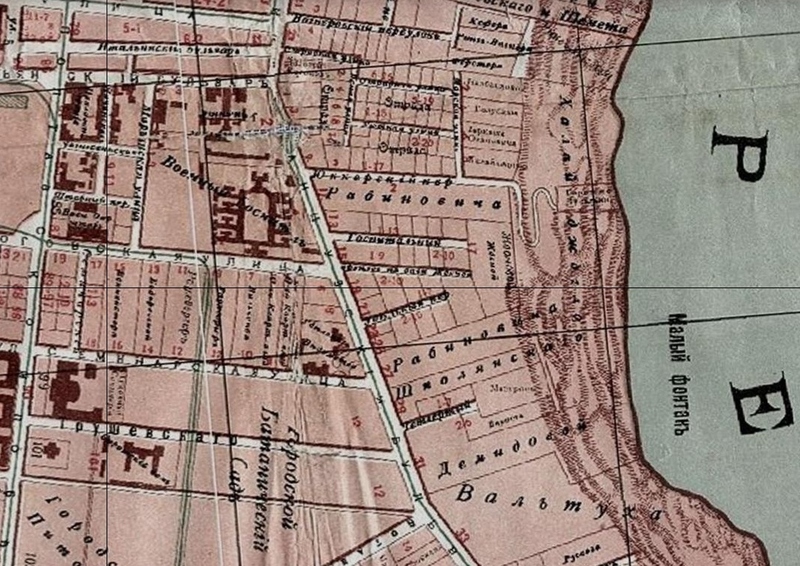 The Hebrew Committee, which derives its funds from the rich Jewish mercantile houses in Odessa, distributed 40,000 rubles during the first week of the outbreak, and reckons that 1,500,000 rubles will be required in Odessa to furnish adequate redress. 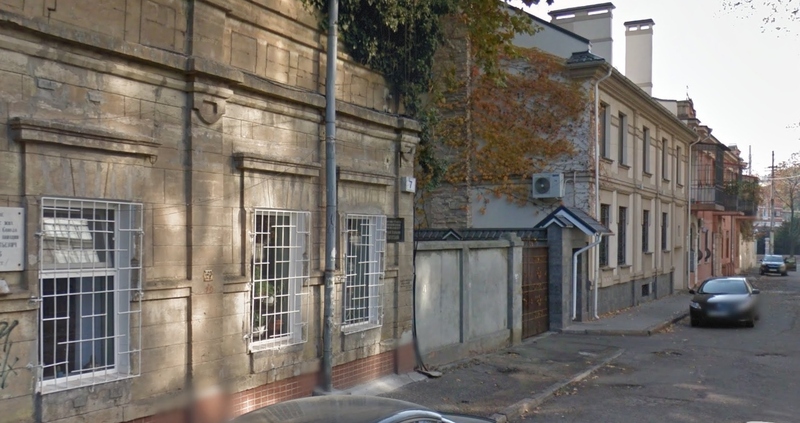 One of the chapters in The Odessa pogrom and self defence is called ‘Slaughter in the attic: a woman’s story’, a first person account about 50 people, mostly women and children, hiding in an attic on Prokhorovskaya St in Moldovanka. The caretaker of the building told the hooligans that no one was left in the building, but they didn’t believe him, forced open the gate and entered. 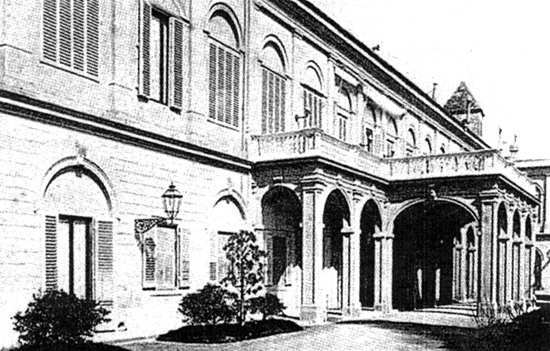 Seventeen were slaughtered in the attic and more than 30 in the courtyard. It is difficult to believe, that with the death of so many women and children in this one building, there were so few women and children in the death records. I gradually began to picture that possibly my grandparents might have been hiding in a cellar or attic. If they lived in a house on the edge or outside the town rather than an apartment, they might have had less choice about whether to flee to a public refuge, like a school or a public building. Instead, they would have had to hide away on their own or a neighbour’s property. There were several reasons why I felt that my grandparents had not lived in the middle of the city, one of which came from an old, badly copied tape-recording of my mother just before she died in 1972. It is almost incomprehensible, but after many years of trying to understand it, I finally heard my mother saying that when her parents first arrived in New York, eight months after the pogrom, her mother did not like the tenement life, where small children rarely when outdoors, and wanted a house with a garden as she had been used to. 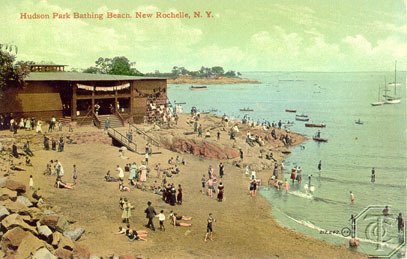 Six weeks later they moved out of the city and rented a house in an immigrant area on the edge of New Rochelle, not far from the sea. Another reason was discovering from a cousin that my grandfather had grown grapes and made wine in his garden in New Rochelle. My grandfather could only have learned about growing grapes in a wine producing area like Odessa, not in his original home near Baranovichi. 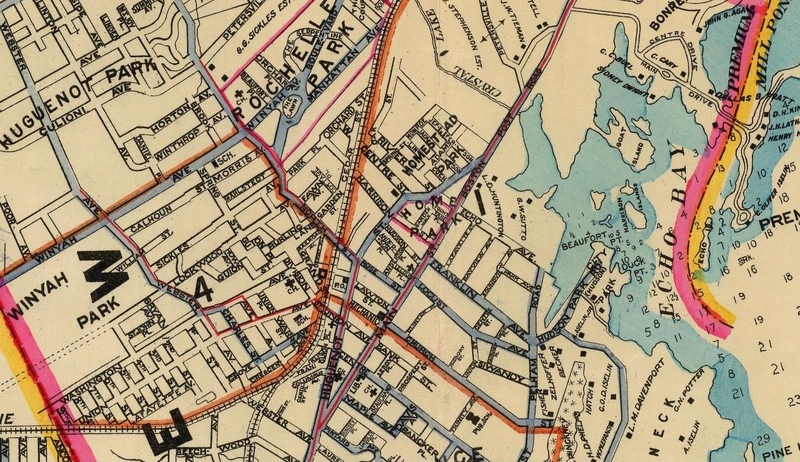 The map below shows New Rochelle in 1900, a few years before my grandparents arrived. 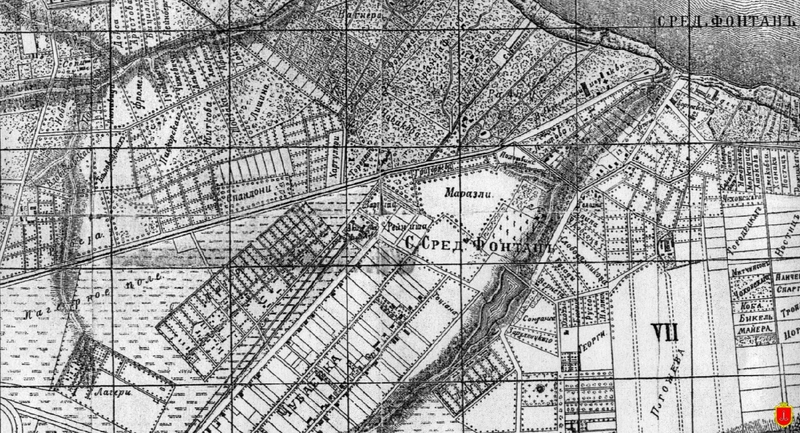 The street they lived on, Oak Street, at the top of the map near the railway line, ends abruptly with no more building beyond. 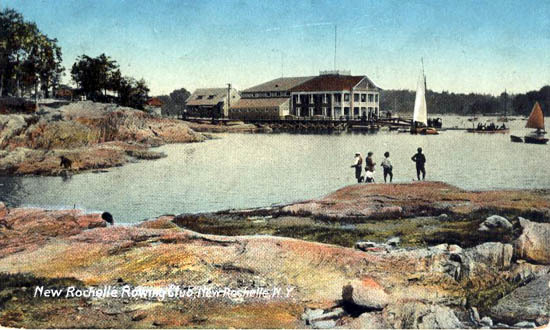 Echo Bay, the inlet off the Long Island Sound near their house is where the youngest son, Michel, who was born around the time they left Odessa, drowned.